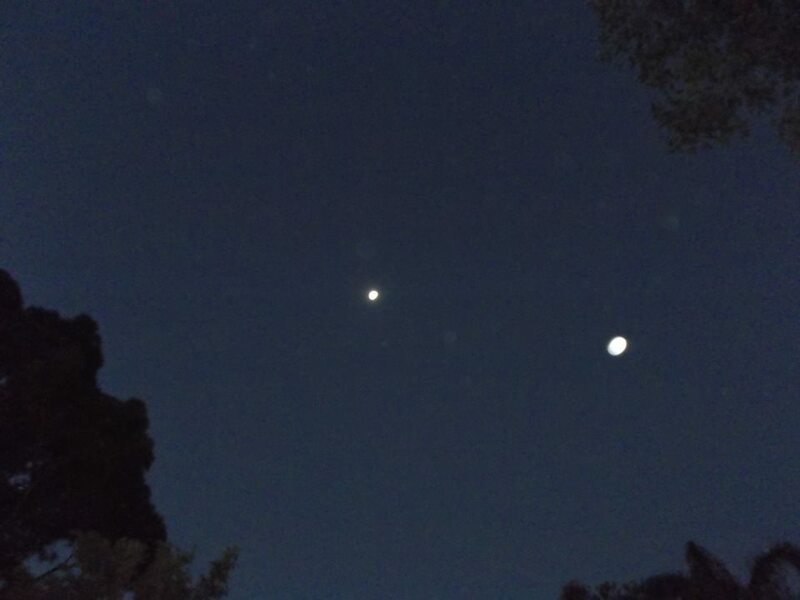 For the purpose of connecting humans on Earth with the presence and reality of our star family & friends of the Intergalactic Confederation (of which our local Galactic Federation is a co-member) part of my service and joy is photo-documenting their ships, along with their projected essences (soul energies) in light forms such as Orbs. 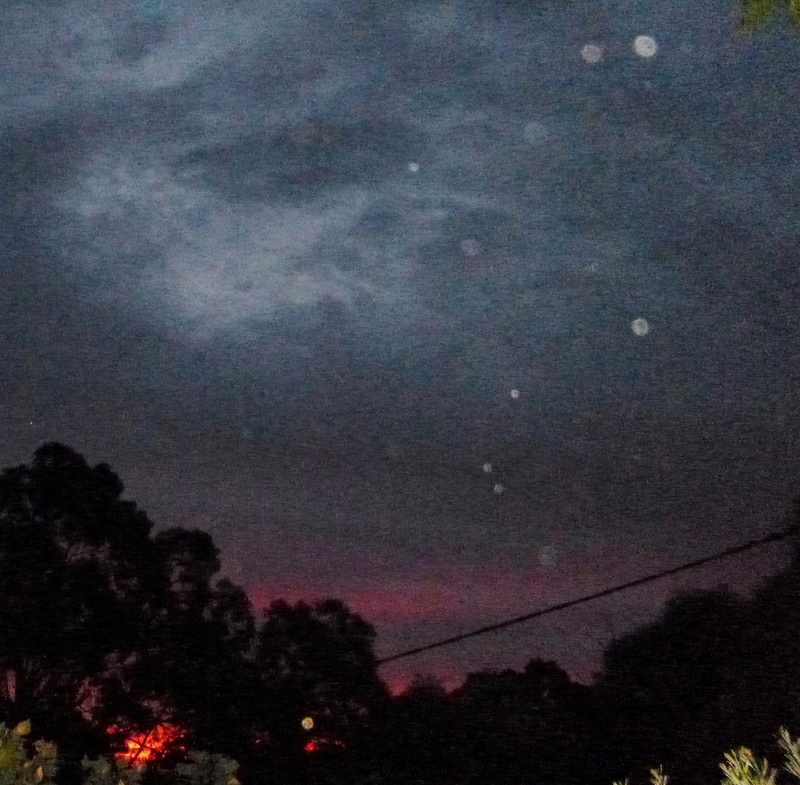 Small ship decloaks beyond treetops, August 28, 2015: Orion humans, of the Ashtar Command/Intergalactic Confederation. 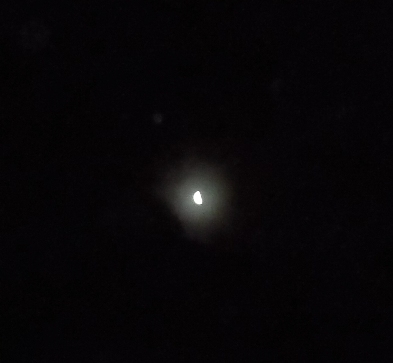 I first sighted ships that I knew were spacecraft and not space debris, satellites, meteors etc. 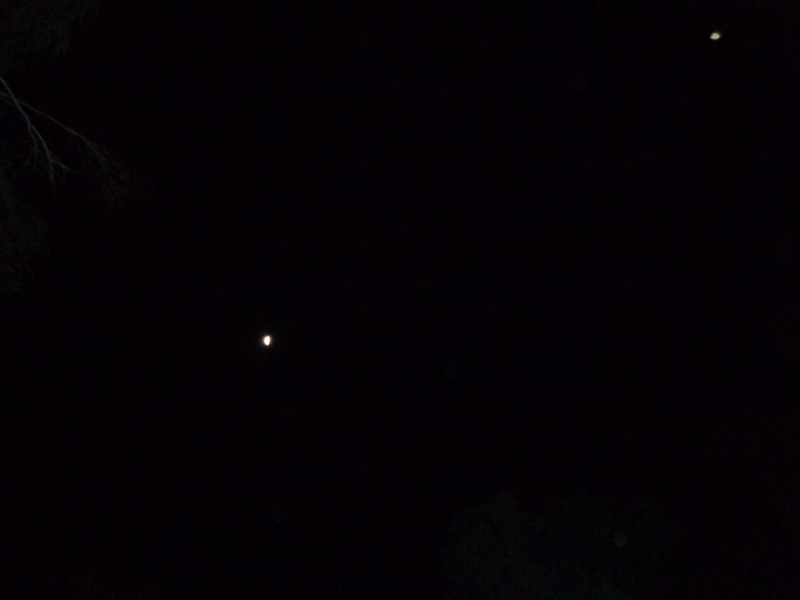 in 2011 while watching a lunar eclipse, just west of the Pleiades. 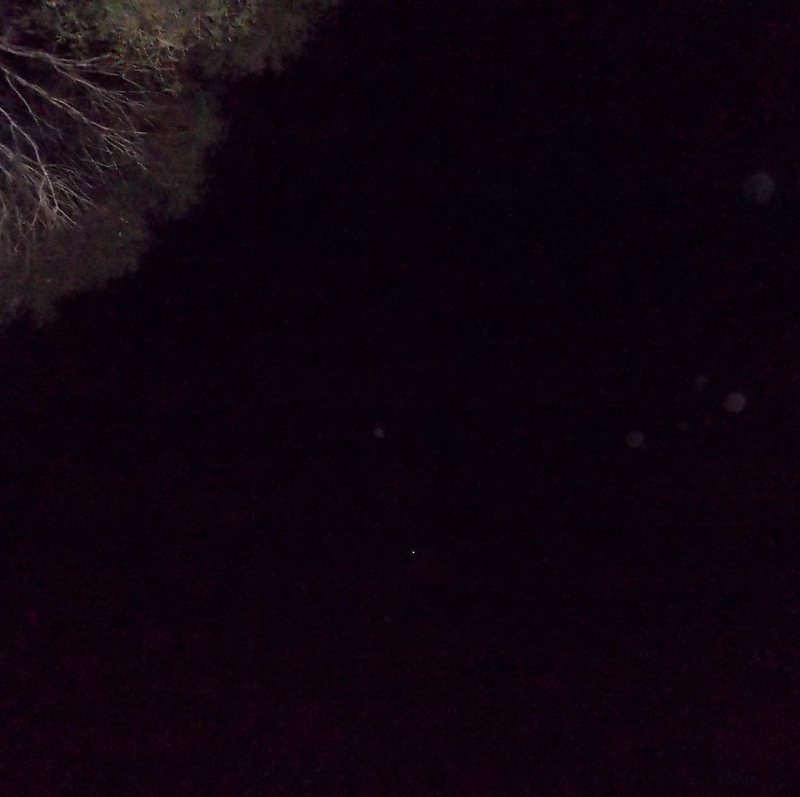 Four white stars dropped slowly down in a diamond formation under the Pleiades. I watched this with a neighbour, and we talked about it….but ten minutes later when I mentioned the ‘four stars’ she had no recollection of them at all. Her memory of them was totally gone. The next night, I felt drawn to watch the same spot, and a single white star dropped down, then shot off to the east at a 90 degree angle. 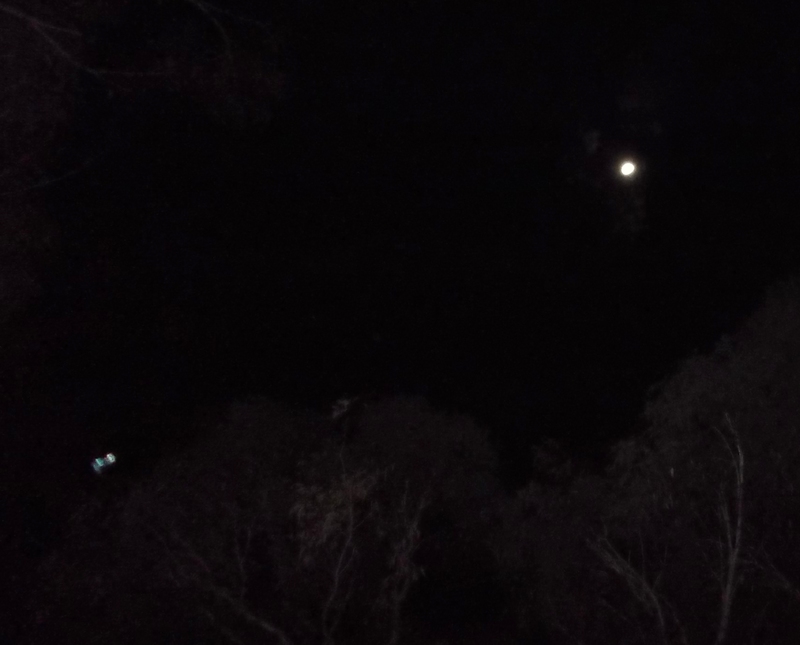 A friend in the south of Western Australia happened to have a telescope trained on the Pleiades that night, and saw the same phenomenon, by way of confirmation…although I had no doubt of what I’d seen, and what it was. It triggered an internal ‘waking up’, hard to put into words. A year later, when I began to experience telepathic connections with members of the fleet, the waking deepened into a knowing – a profound remembering of multi-dimensional aspects of my Soul, certain strands of galactic history, roles of various beings in it, and my connections to them. A note on telepathy/telempathy: when loving higher frequency beings communicate telepathically, it is not so much a ‘speaking into your head’ as a flow into your heart, your heart-mind as One, a stream of warmth and light that is in itself a message that converts into words. This process is virtually instantaneous, but I find the first feeling is a clear warmth in my heart (rather than ‘voices in my head’). NB: When opening yourself to connect with our family of the stars, please be aware that our galaxy has been through aeons of conflict in the lower frequency levels, where certain beings have sought control and dominion over various galactic regions, planets and other species. Some star systems are completely clear of those influences (fully ascended systems such as Sirius, Arcturus and Procyon). However, many systems contain some stars/planets that are established in higher dimensional frequencies of love/unity consciousness, and some that are still under the influence or control of lower energies/beings. Of well known constellations, some examples are Orion (though much is currently shifting there), the Pleiades (which had long wars with invading reptilians and mantids from Orion – Alcyone, Asterope and nearby Atlas are ascended, while Maia and some of the other stars/planets are not), Cetus (Tau Ceti is ascended, Alpha Ceti is not), and Centaurus (Alpha Centauri system of three stars is ascended, other areas of Centaurus are under lower energies). It is essential to centre yourself continuously in your heart chakra/inner heart (see the Practices page for assistance and fine-tuning exercises), so that you can truly feel what energies are around you. The mind is easily fooled, the clear inner heart knows. It’s worth the inner work! Specific advice can also be found in Tips for Ship-watching & Star Family Contact. 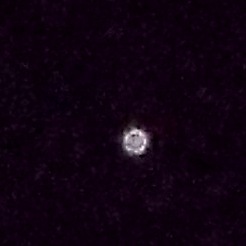 Jan 22, 2014: ship heads toward a triangle or orbs at the right (north), that are marking the position/holding a time-space portal, through which the ship ‘disappeared’. 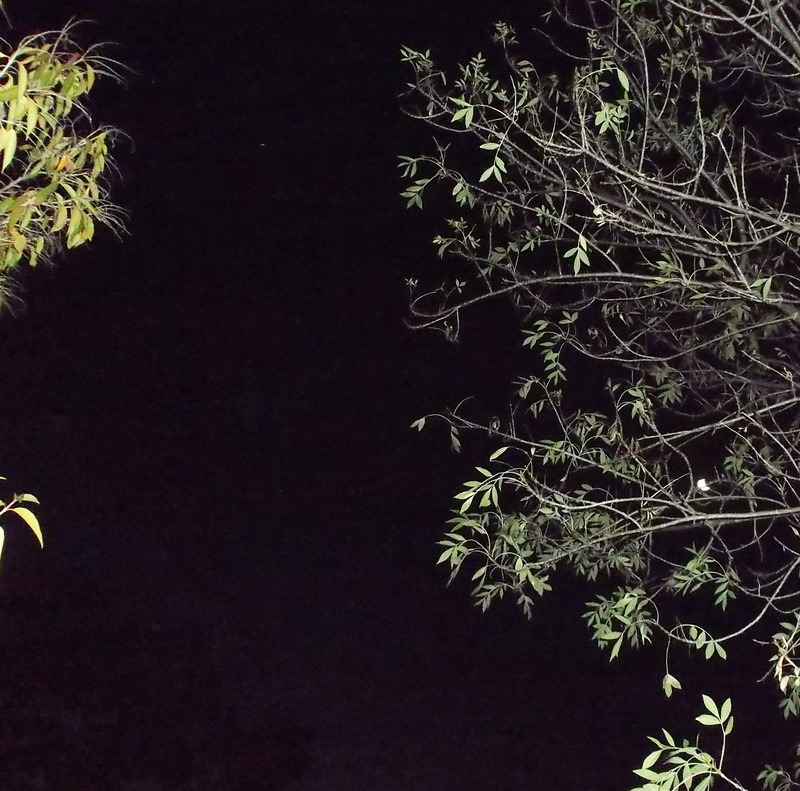 Although it appears as a white pinpoint of light in these photos, the Shem Arua was clearly visible in 3D for some 5 minutes, as a golden star shape. My Twin Flame, Ashura (also known as Arnap in the Ashtar Command fleet) currently captains the Shem Arua. I also have close connections with a leonine being on board, whose name is Al’tara (God’s New Earth, or more literally, God/Source-Base of Light/Sun). 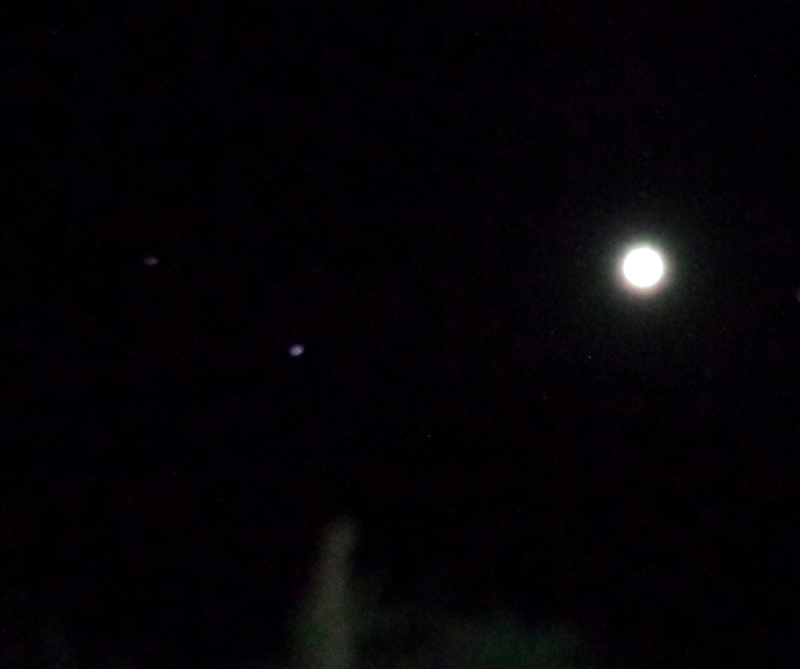 She comes from Toleka, a planet of Sirius A which is home to the leonine beings. 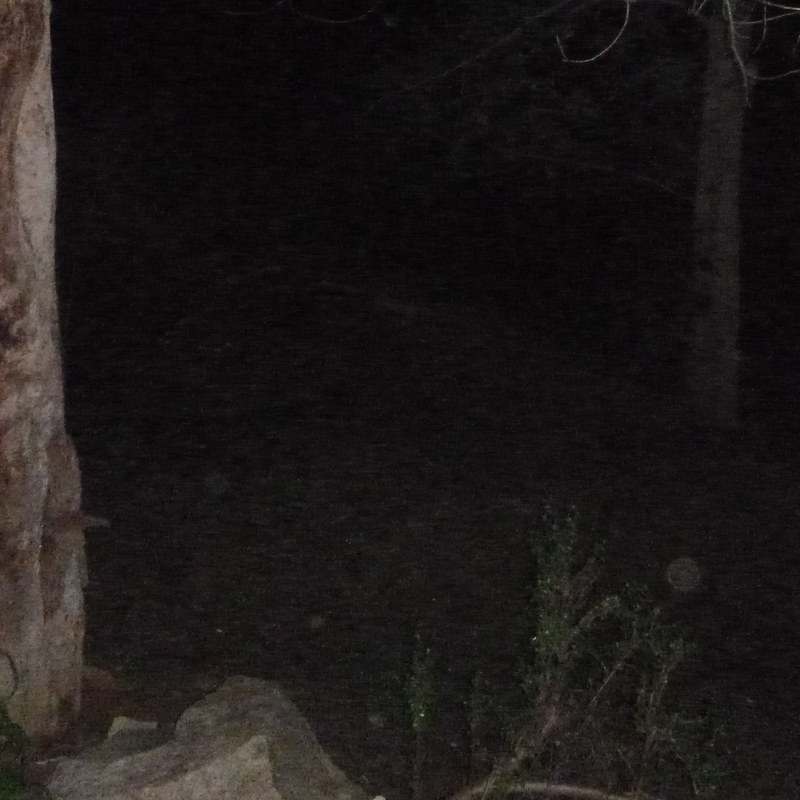 Al’tara visited from the Shem Arua in a small, disc-shaped craft, which appears here through a narrow window between trees on Feb. 4, 2014. 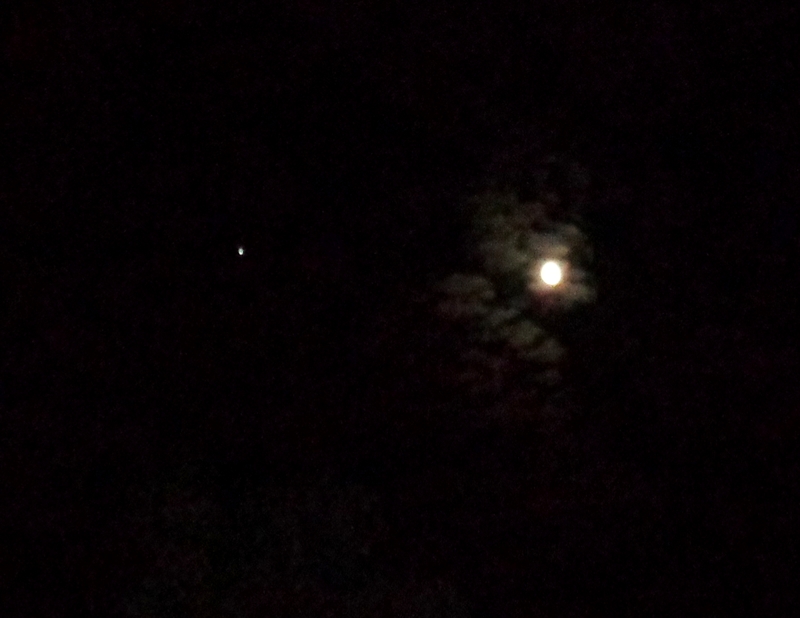 I was called to look at the Moon, which was behind branches, and the ship appeared close by. 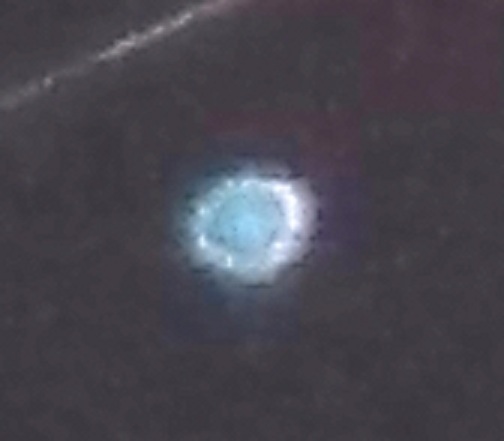 The next ship, the Shem Arua (a ship of Sirian origin that has had an Arcturian ‘refit’) had been camouflaging as camera lens refraction in green-blue concentric rings for some time. I asked, if it was timely, could they give a photo that identifies their craft’s form as a ship. In answer, the ship moved behind a cloud. 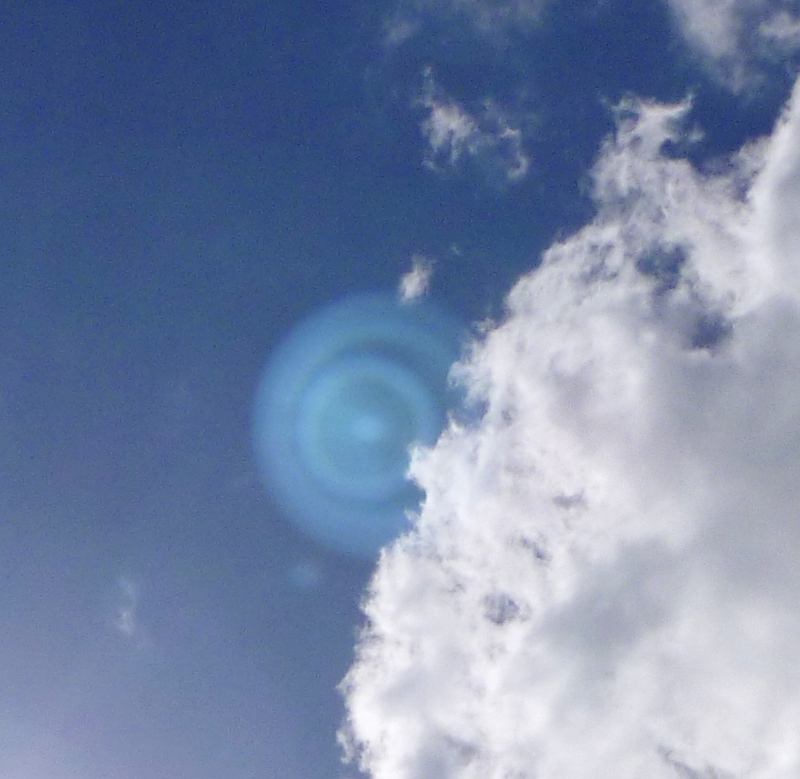 As you can see, there is no colour/outline of it in front of the cloud as would be the case with lens flare, clearly showing itself as a spatial ‘object'(this is the ship’s 4D representation. 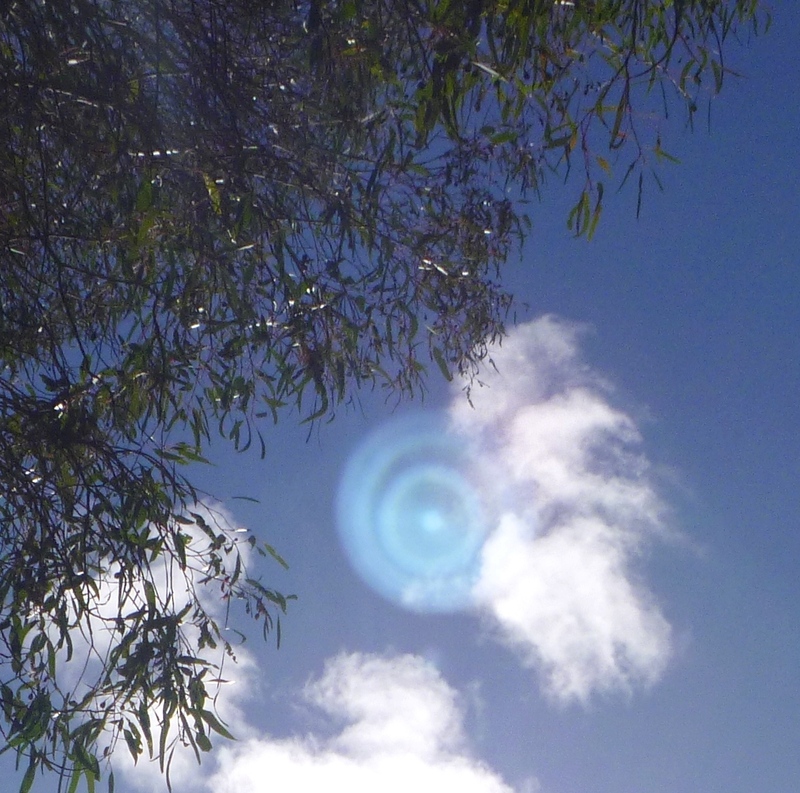 In 5D+ it appears as a bright sphere of white light, and in 3D as a large silver-white disc-shaped craft: see below). 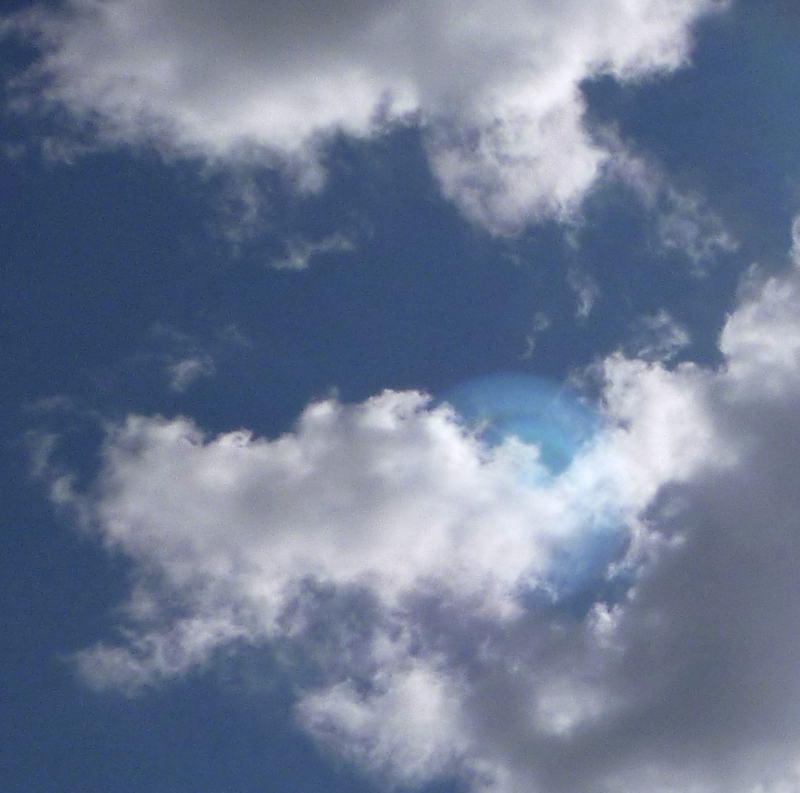 May 3, 2014, the Shem Arua appears from behind clouds. June 1, 2014, Anjurian ship. 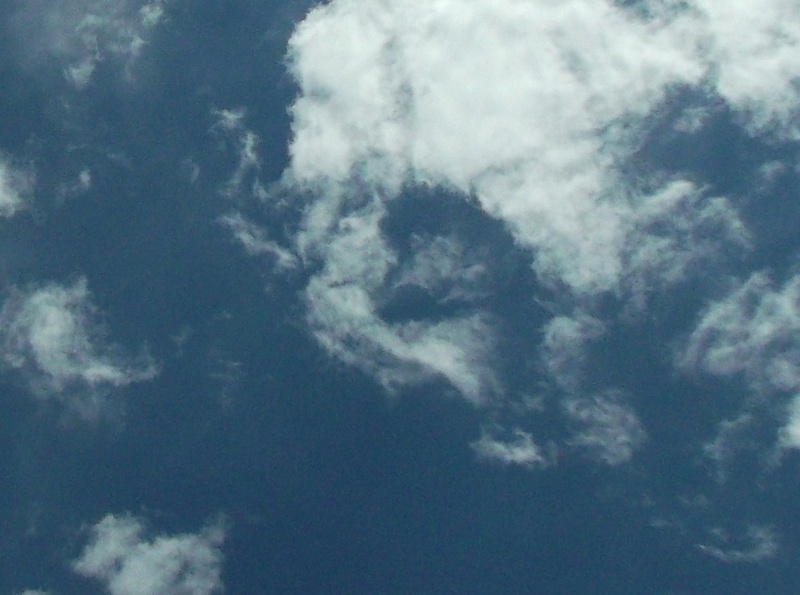 The Shem Arua (see this page) returned on June 23, 2014, and appeared again ‘peeping’ from behind clouds. 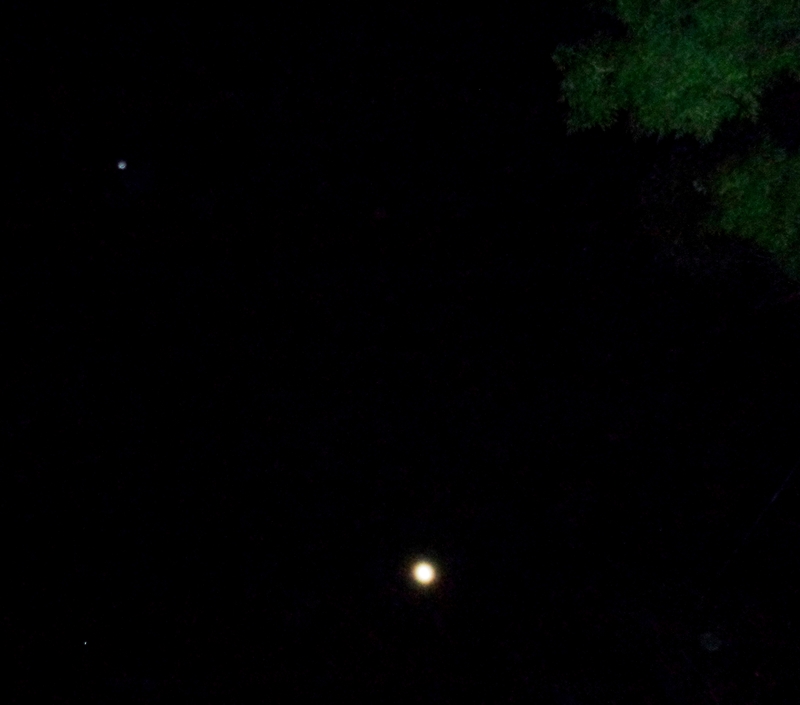 Star family always locate their ships precisely for my ‘sightline’, which is sometimes only a narrow gap between trees. Shem Arua returns June 23, 2014. 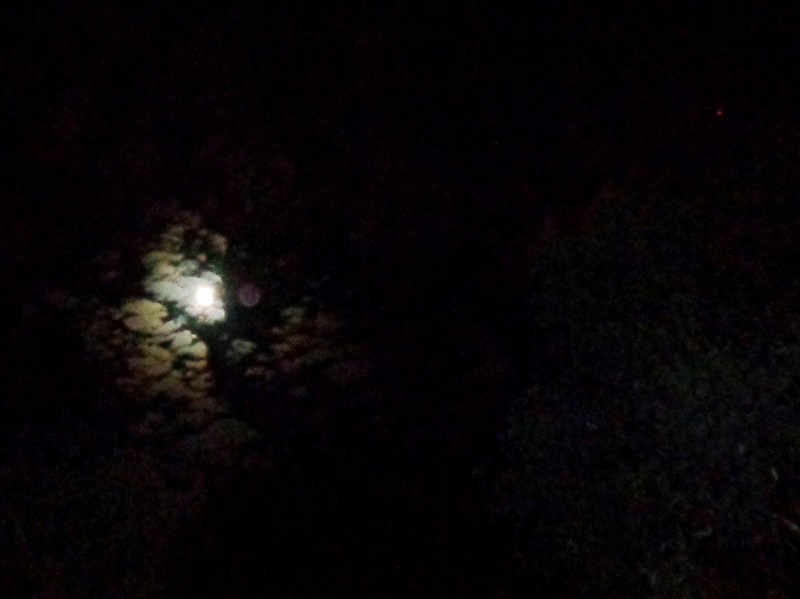 A beautiful craft of 6D leonine beings showed itself on June 29, 2014. 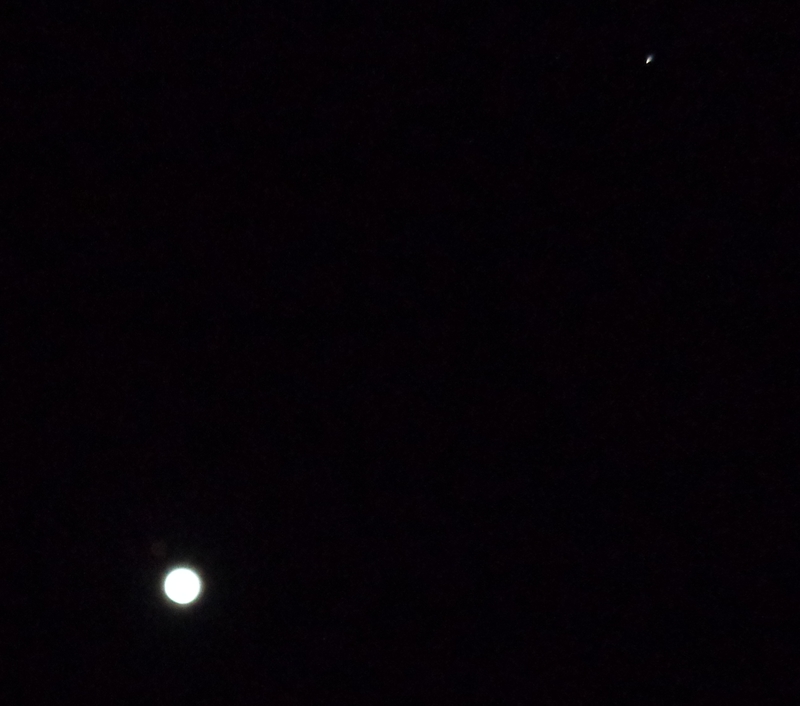 In the first photo, it is approaching the moon (crescent, lower right) from the upper left/southwest. 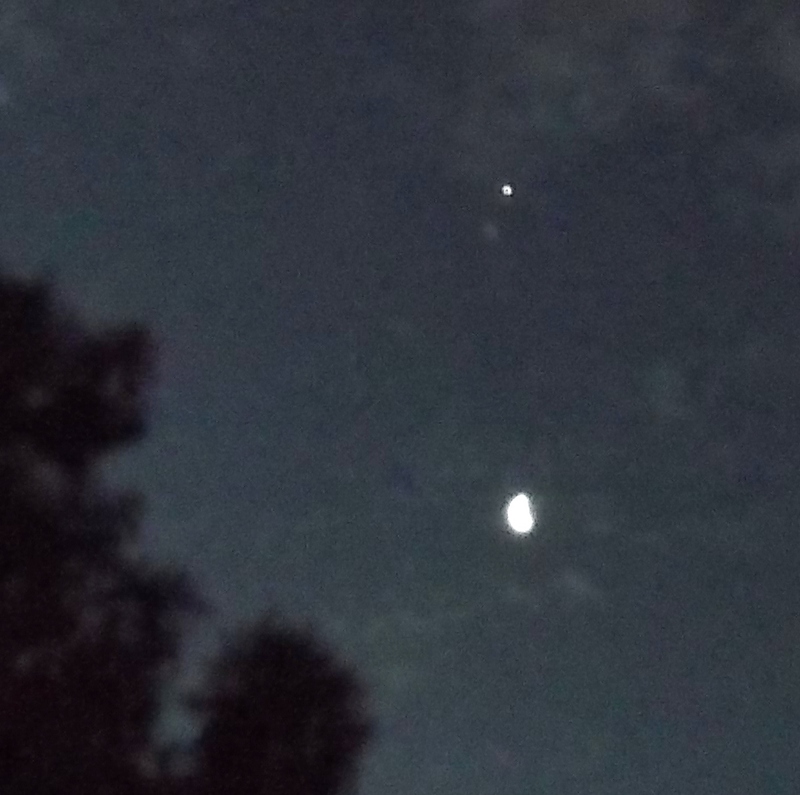 Leonine ship to left above the crescent moon, June 29, 2014. In the close-up, you can see the ship is cylindrical, with spinning hexagonal ‘wheel-like’ structures at either end. Close-up of leonine ship, June 29, 2014. 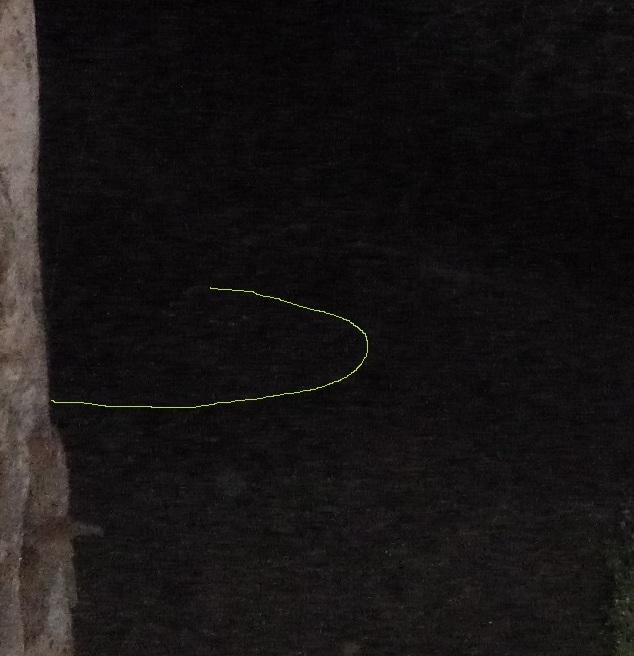 These next photos from October 2014, show a small disc-shaped craft with a ring of horseshoe lights. (I first dreamed of ships with this horseshoe ring, about seven years ago). 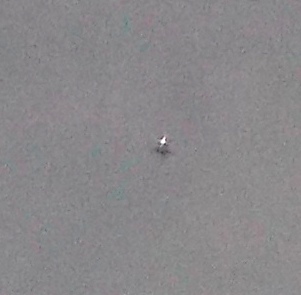 This was my first actual sighting of craft from Alpha Centauri (see this post). 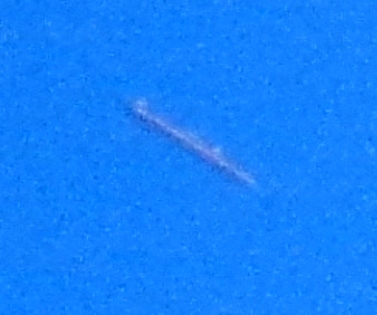 Alpha Centaurian ship, photo taken October 14, 2014. Close-up of Alpha Centaurian ship, with an identifying face projected inside the ring of lights (Je’errne’on, captain of the ship). Brightness reduced, to show the horseshoe shaped ring of seven lights. Same Alpha Centaurian ship, side view. 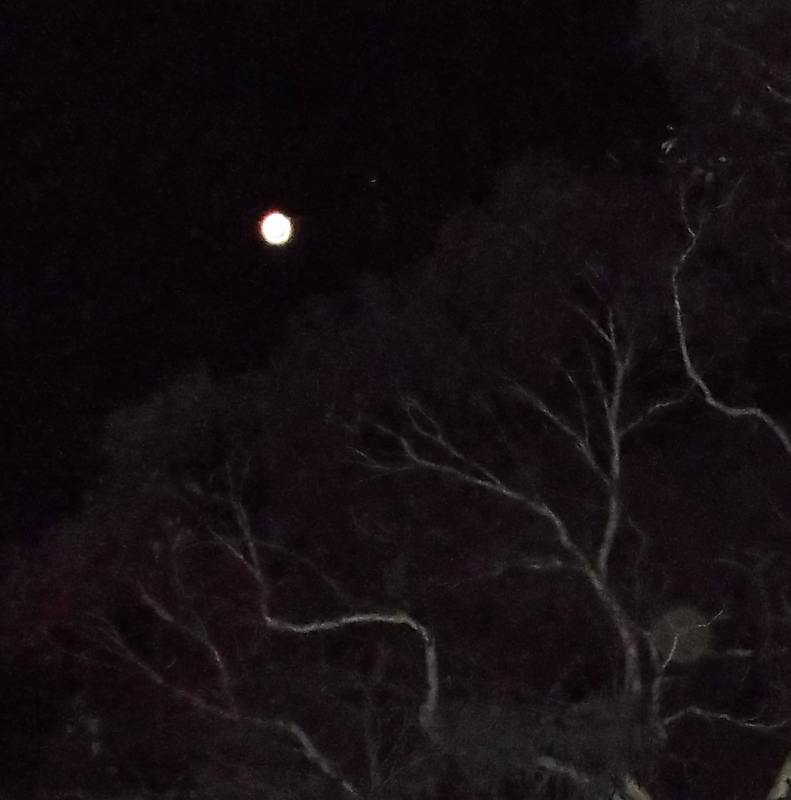 Ashura’s ‘pod’ ship above the trees, right of the Moon, Nov. 5, 2014. 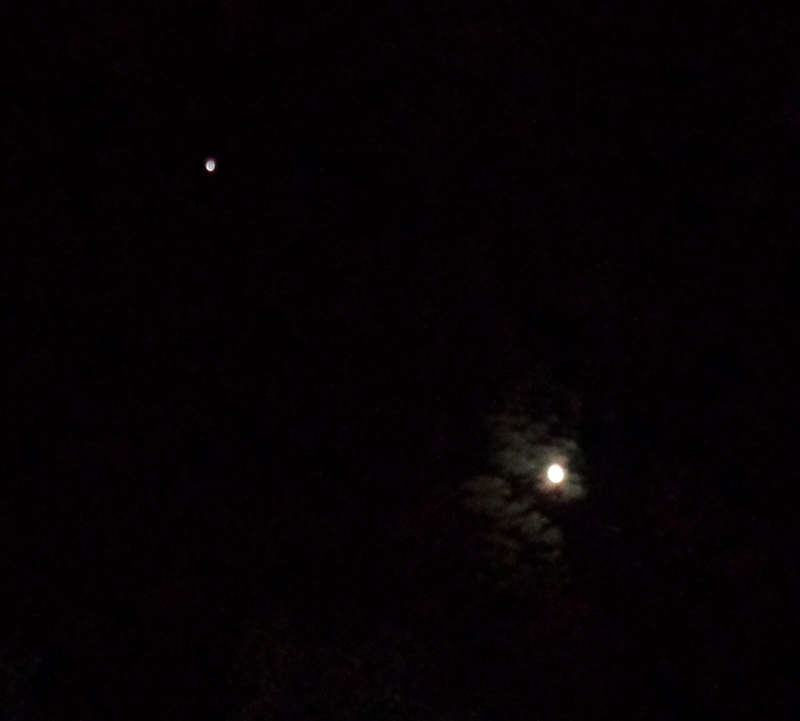 Ashura’s ship far left, low over trees, Nov. 5, 2014. 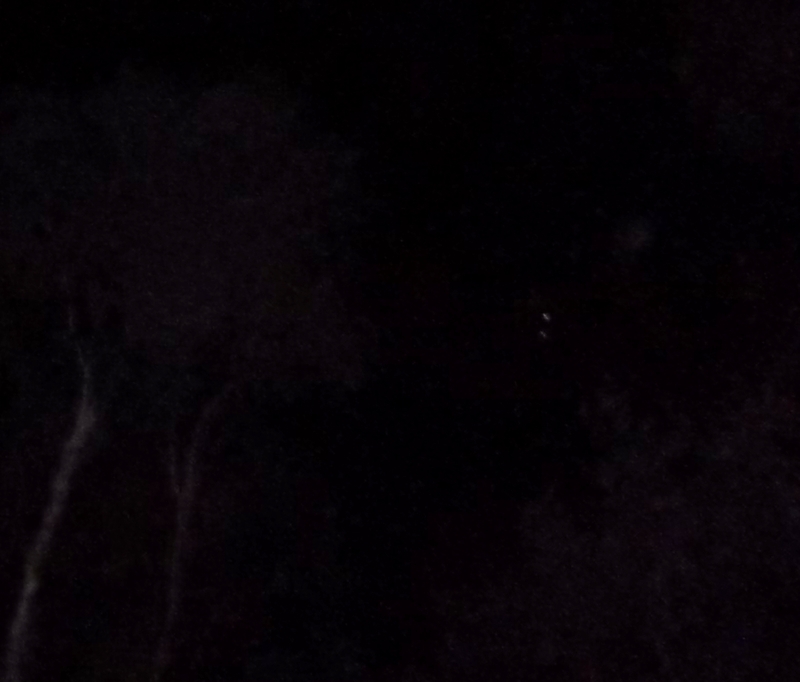 Ashura stations his ship directly above a tree. Ashura moves left of the tree, joined by two more small ships from the right. 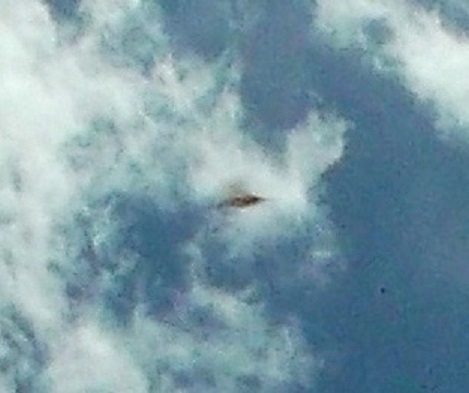 Small silver disc ship, also from the Shem Arua, appears and flies down left of the tree. 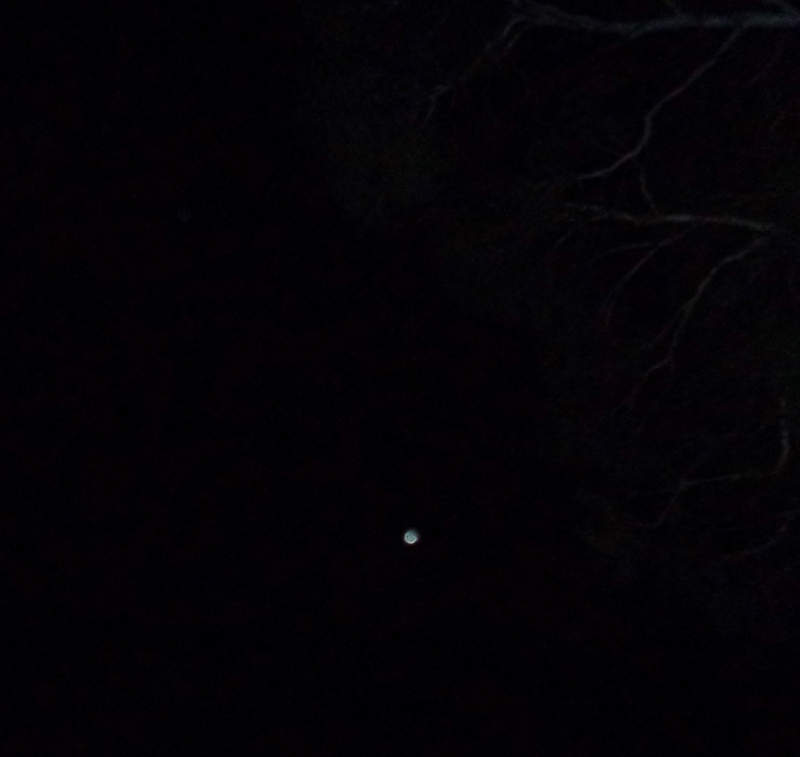 Ashura resumes position above the tree, with an orb to the left. 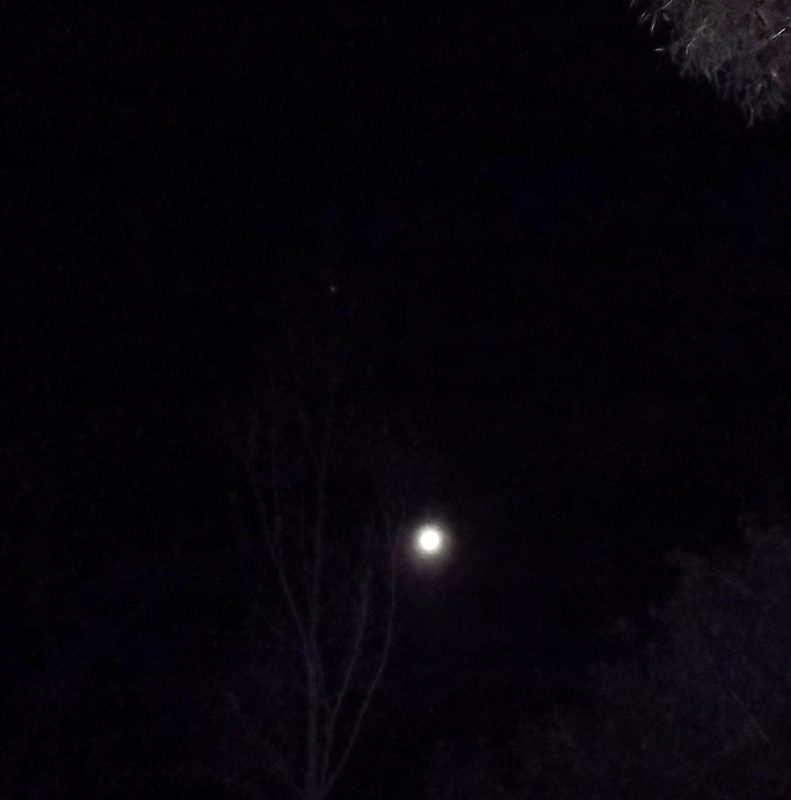 The small silver disc ship lands on the ground, into 4D, deeply cloaked. It’s rim is just visible; see second pic. 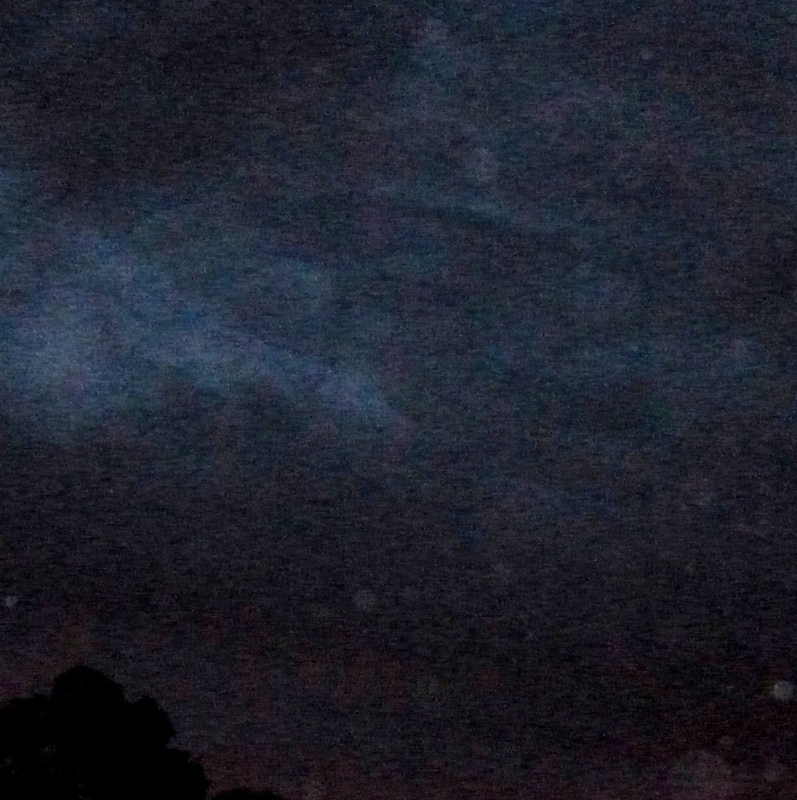 Close-up of cloaked ship (see Lights in the Sky: Love on the Ground for full shots and details). 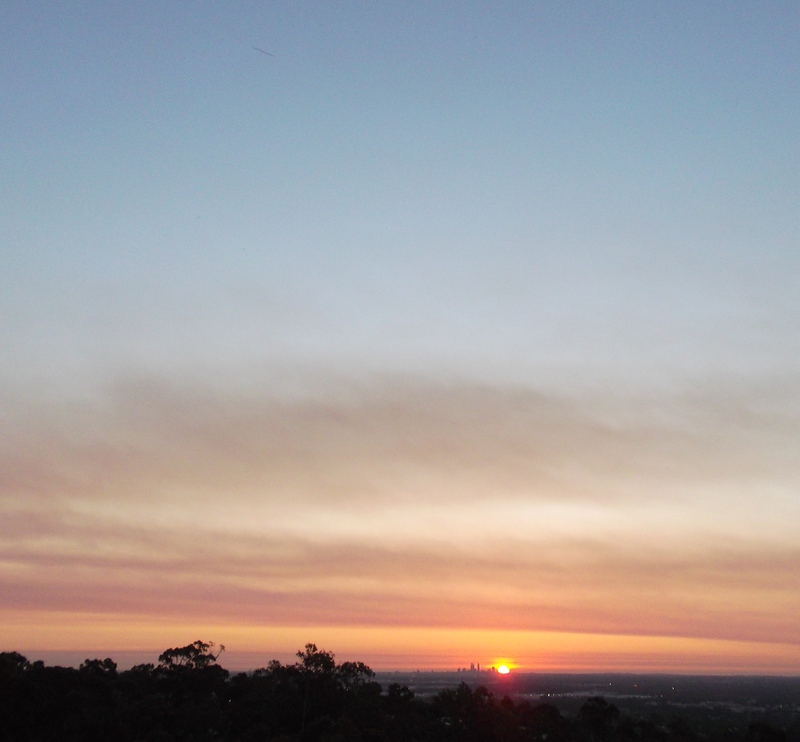 Shortly after this, I saw the Shem Arua ‘decloak’ into 3D, several hundred feet above the city of Perth, while driving down from the hills where I live. Its disc-shaped 3D form became visible as if a cloth was being peeled smoothly from it, from right to left. It could be seen for a few seconds as a large silver-white disc, before recloaking again from left to right. 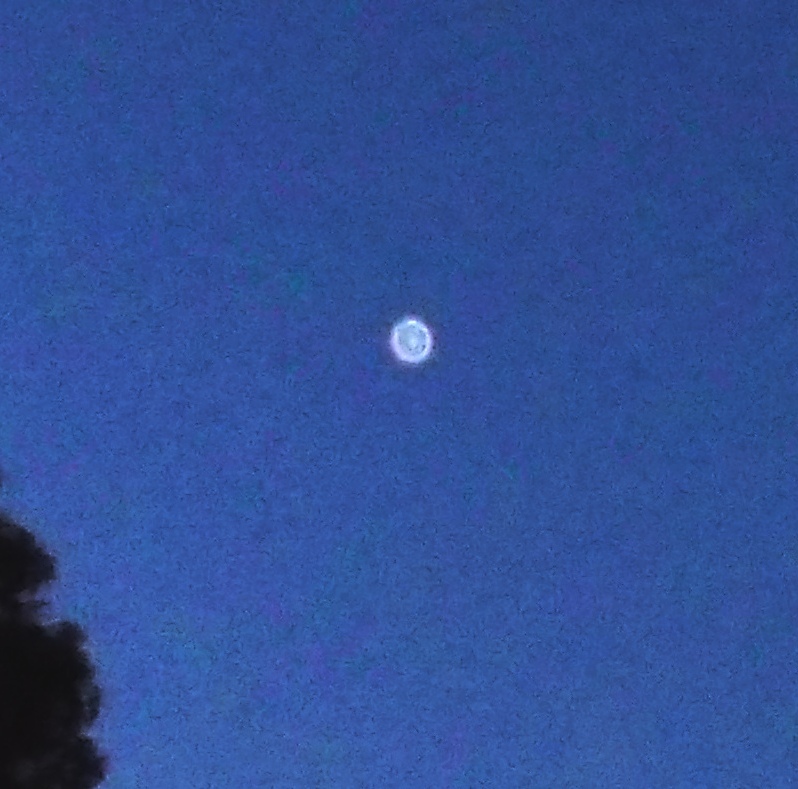 I sighted it again on March 2, 2015, as a bright silver disc, for about 2 seconds, then it moved behind a cloud. 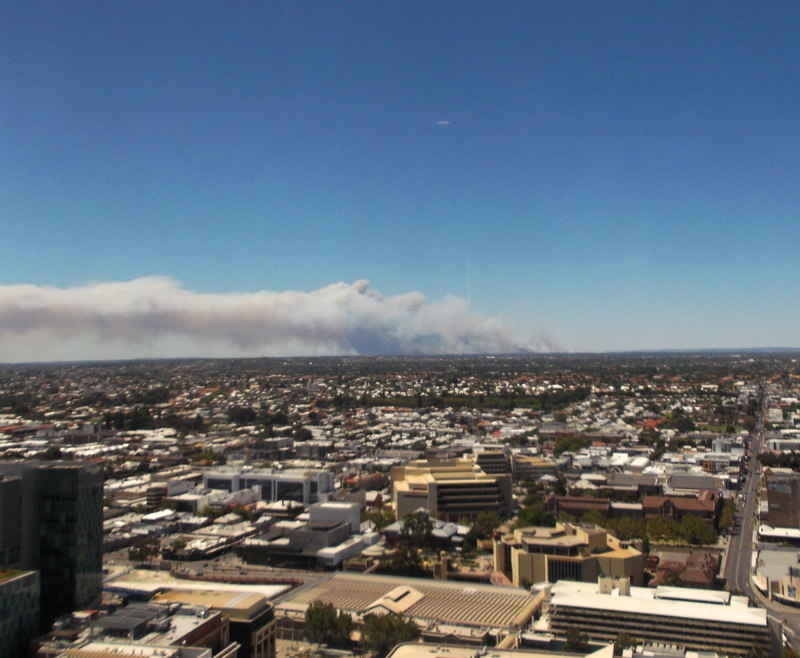 On January 10, 2015, it was present, very close to the east of the building in the city centre of Perth, where I was at a restaurant on the 33rd floor. 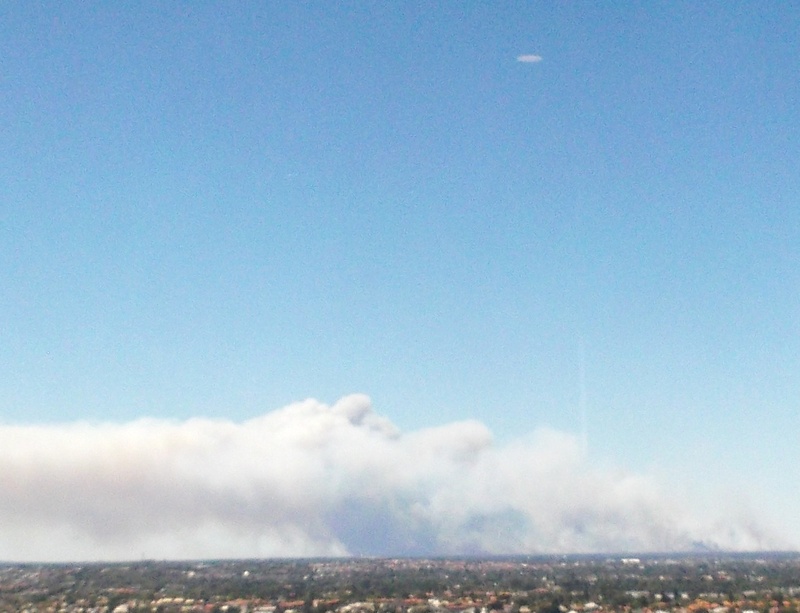 From that height, there was a clear view of a fire burning out of control to the north, and I had read online that people and their homes were at risk. 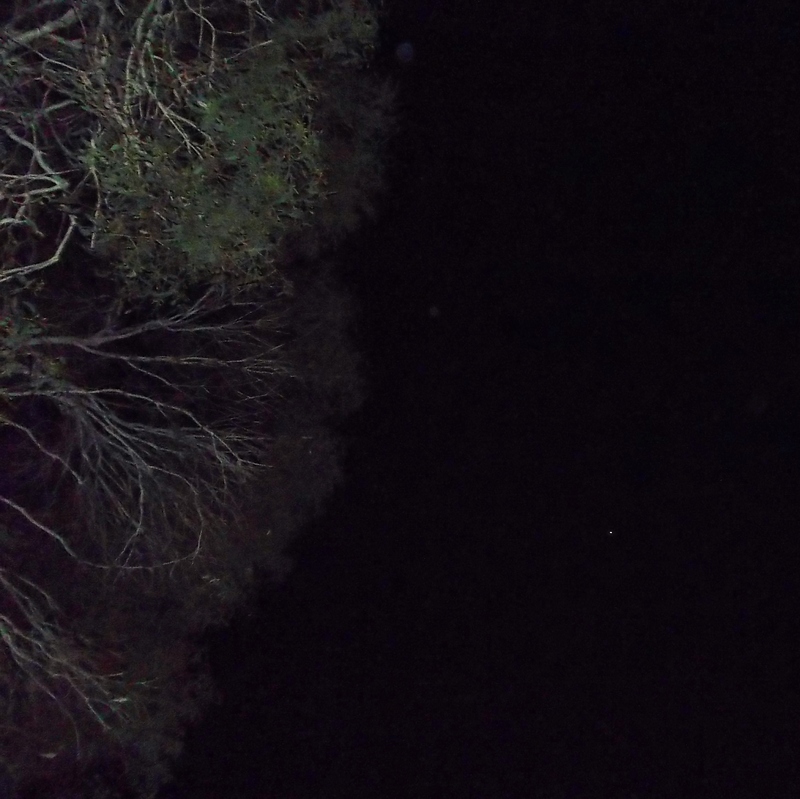 I asked star family if they could please help, then took these photos about a minute later, of the ship hovering directly above the fire, and a beam of white light going down to the earth, at the fire’s ‘ignition point’ (a town called Bullsbrook). Thank you dear ones. 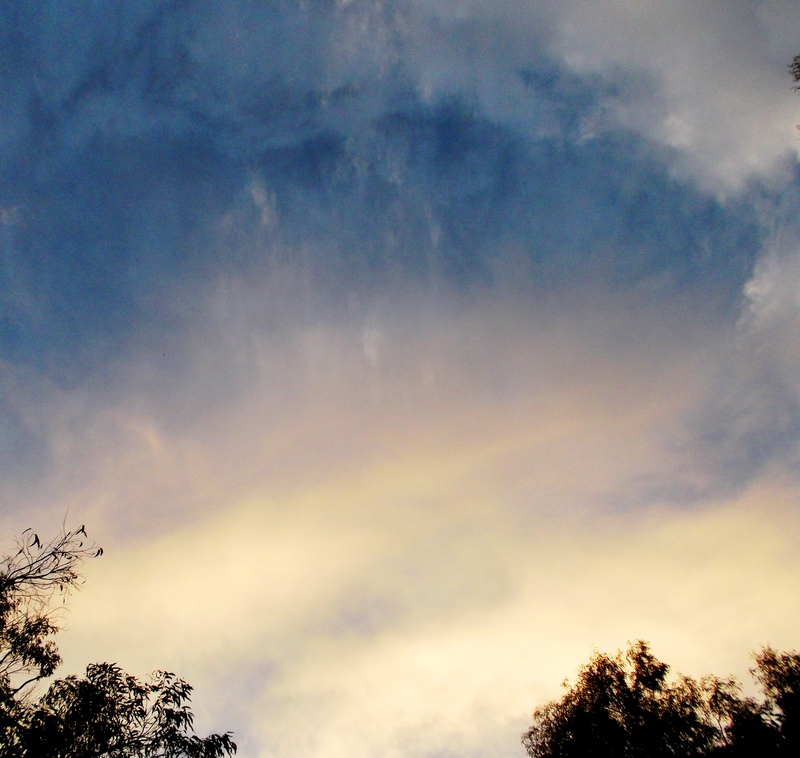 This next photo shows a disc-shaped ‘hole’ in the clouds above my garden, where the Shem Arua was stationed on Jan 5, 2015. It’s also the same spot where the ship’s presence showed in ‘cloudship’ form on Oct. 7, 2014 in a stunning photo taken by my friend Rob Hartland, who lives a few streets away. You can see his photo in this post. 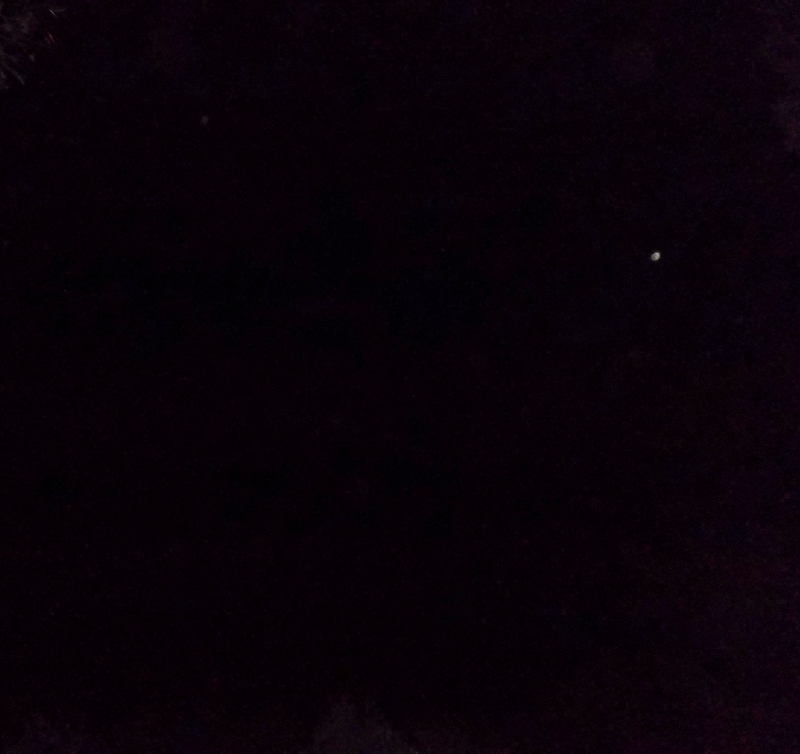 The next photo was taken on February 12, 2015. 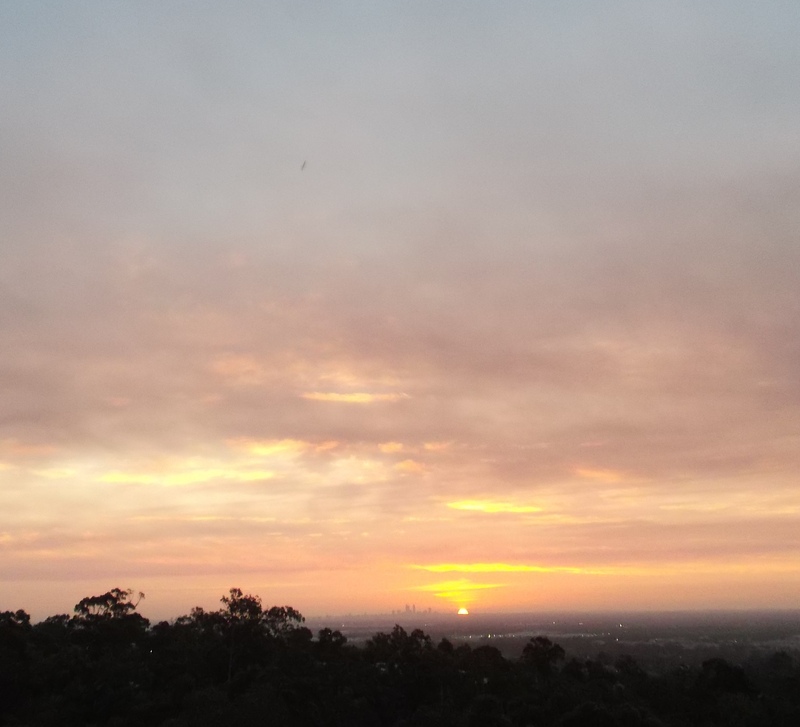 There was heavy smoke in the air from bushfires, but the outer rim of the Shem Arua is visible in the clouds, and the bowl-shaped underside. 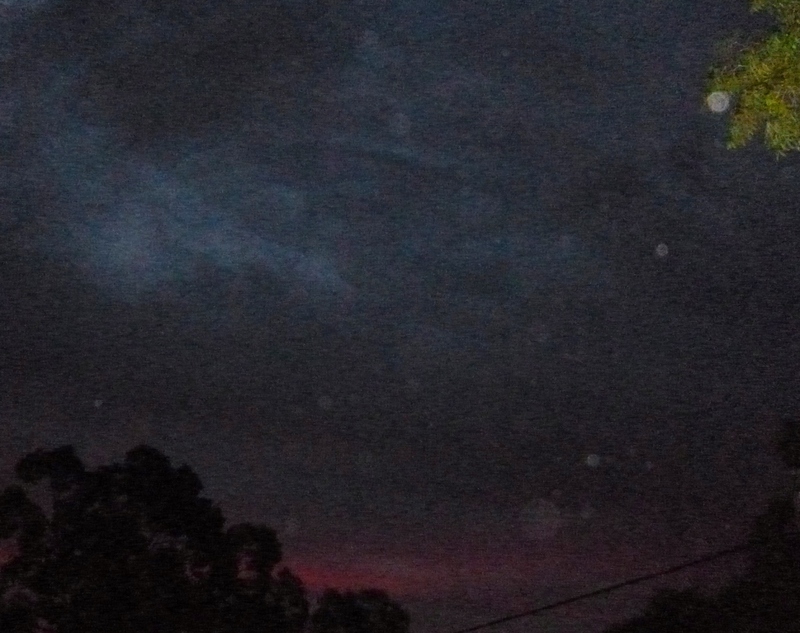 In this photo, the ship is behind the dark, roughly disc-shaped patch of cloud in the centre, and to its right and upper right, smaller ‘walnut-shaped’ ships are showing in the clouds. 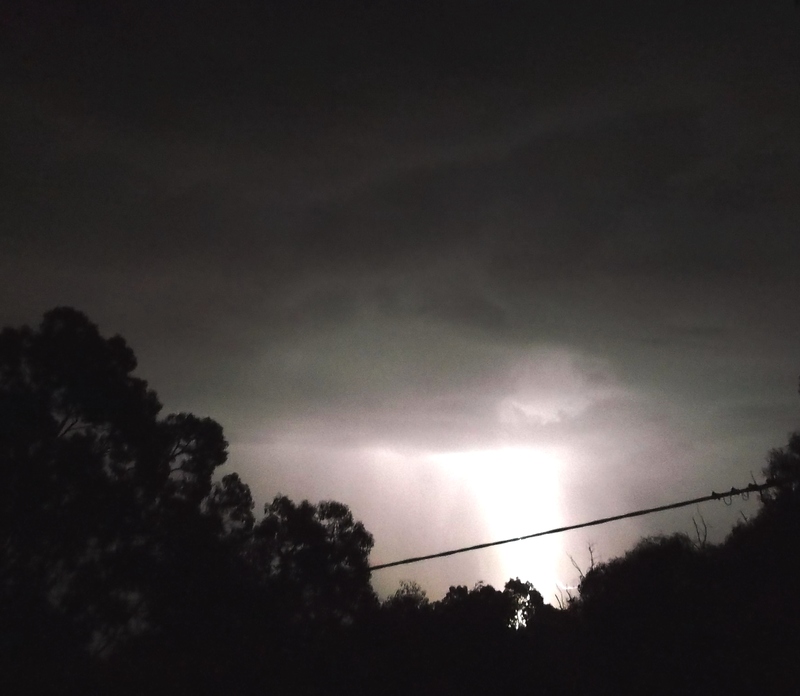 Also from February, 2015, the magnificent ship below ‘lit up’ during a thunderstorm. 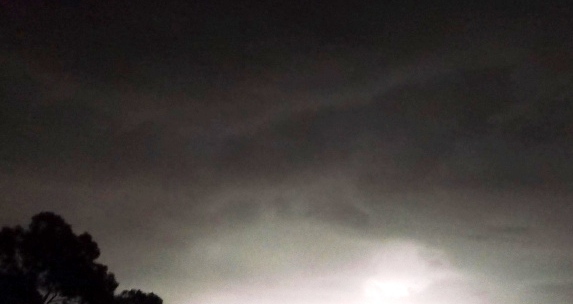 It appeared as a shallow crescent or bow-shaped craft just above the lightning pillar, slightly left….and above that the outline of a very large ‘boomerang’ shaped ship is visible in the clouds. 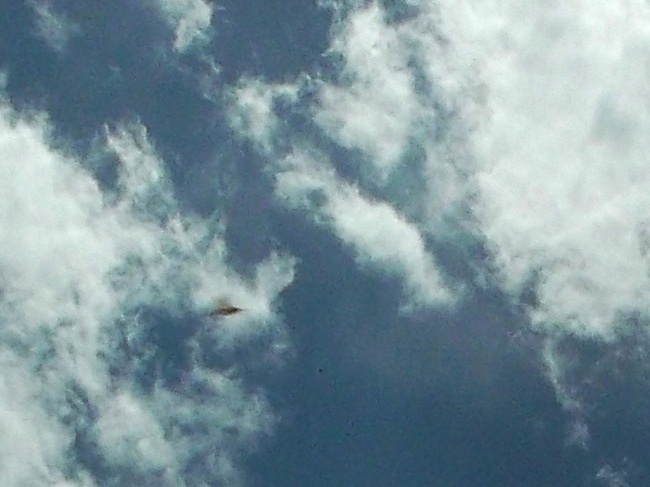 I now know this bow – or winged sun shaped – ship as an Arcturian sister ship to the Shem Arua. Its name is the Ahura’Tua, and it is captained by Shem’Ash and Aya (see this post). 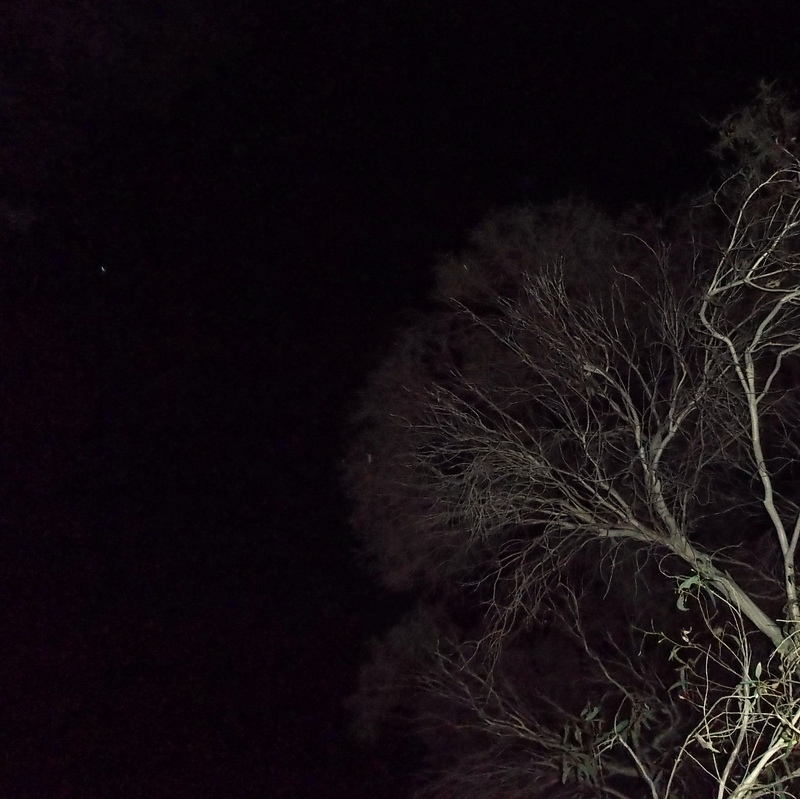 Photo take Feb.2, 2015, Ahura’Tua just above the light column, slightly to the left. 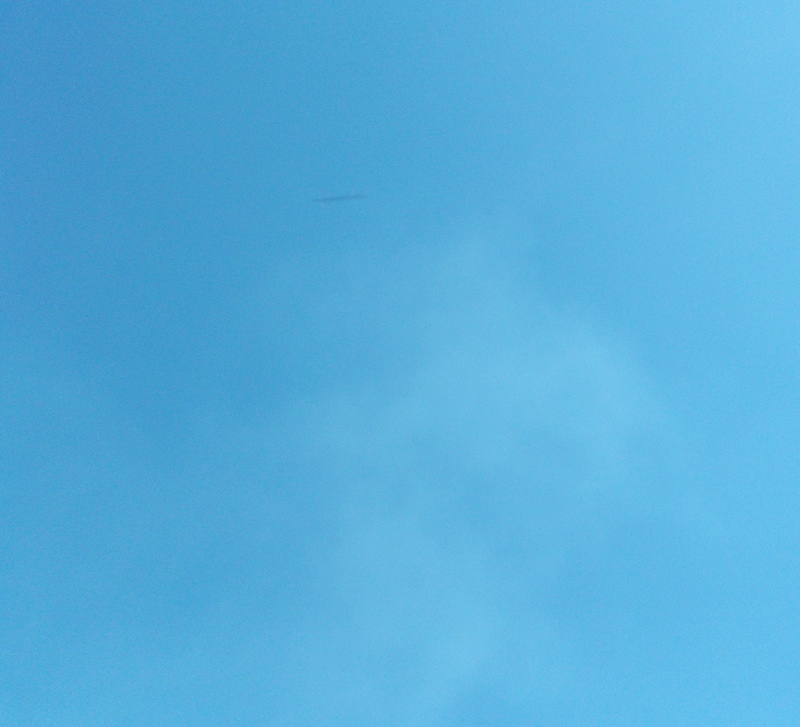 I took these photos of the Ahura’Tua on October 11, 2015. It was very high; they advised me to look for V-shapes in the clouds, and that the ship was nearby. 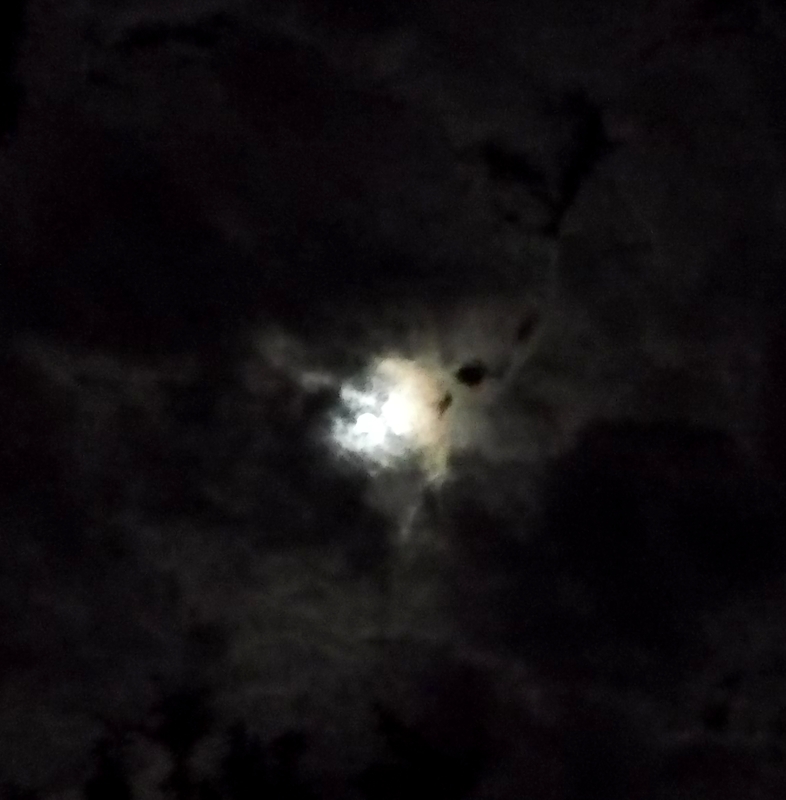 Ahura’Tua cloaked, partially behind clouds, to the left of a ‘V’ in the clouds, October 11, 2015. The Ahura’Tua is an Arcturian bow/crescent-shaped ship. 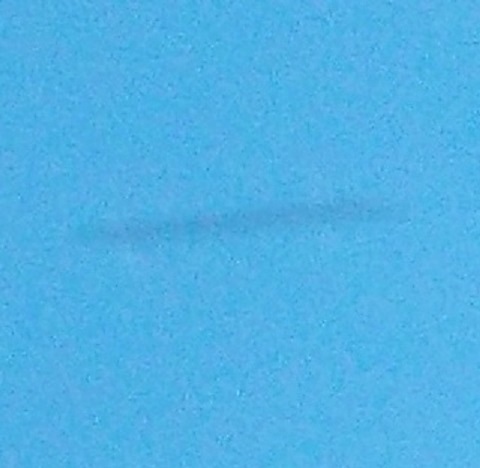 It appears dark in these photos as it is cloaked, but you can still see the shape of the ship. Uncloaked, it is bright silver with a golden disc on the upper front part of the ship. 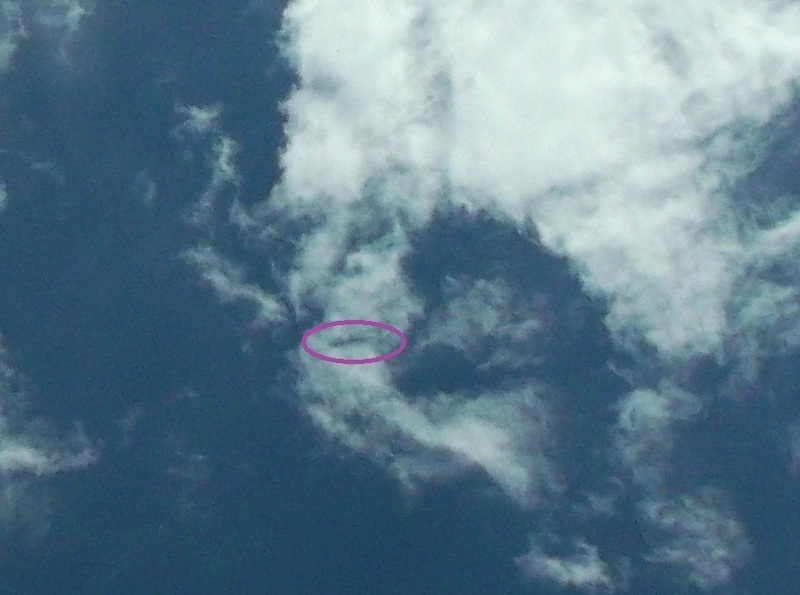 Close-up, Oct 11, 2015, right side of the ship emerging from cloud. 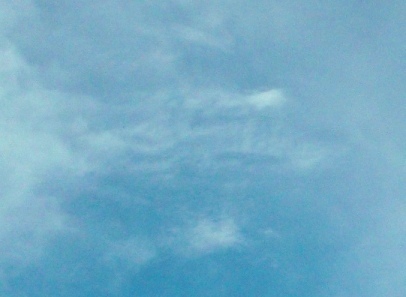 Winged bow shape of this angelic ship is visible. 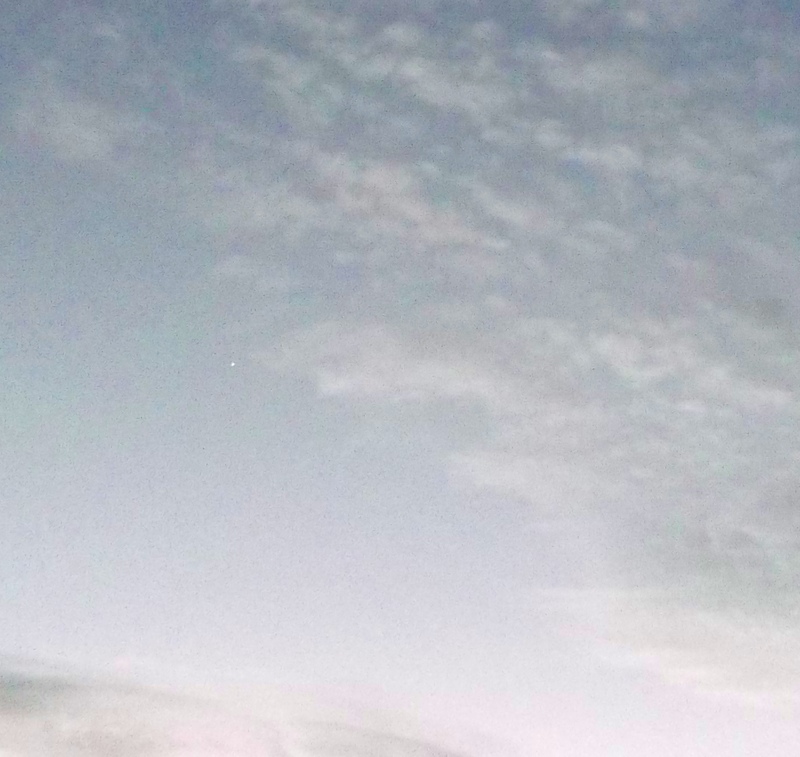 The Ahura’Tua was semi-visible again later that day behind a cloud to the left of a very distinctive semi-circular/cross-bar (or bow and arrow) shape in the clouds. 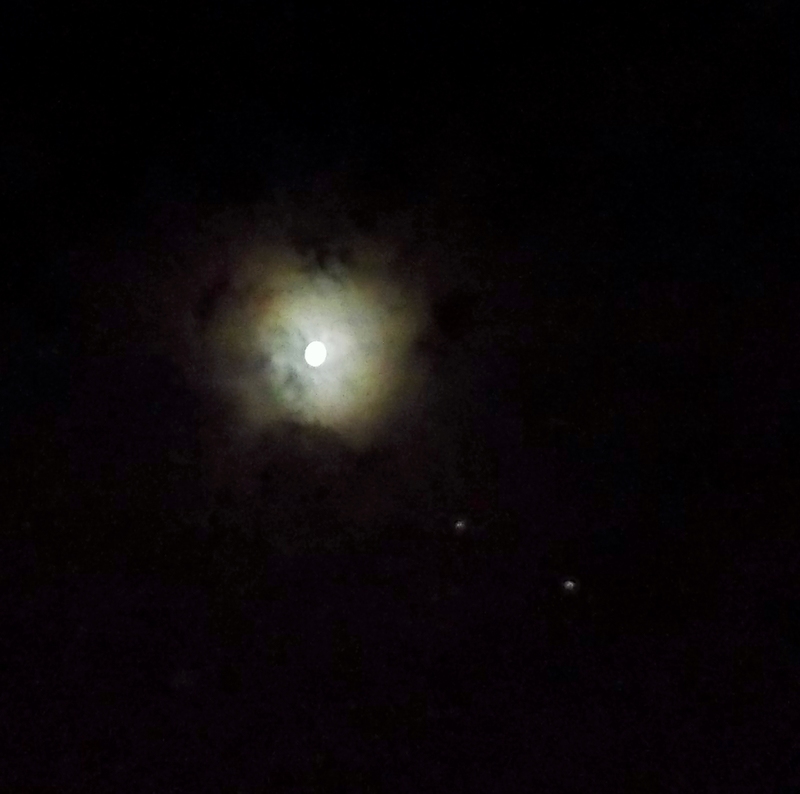 Ahura’Tua fully behind clouds, October 11, 2015. 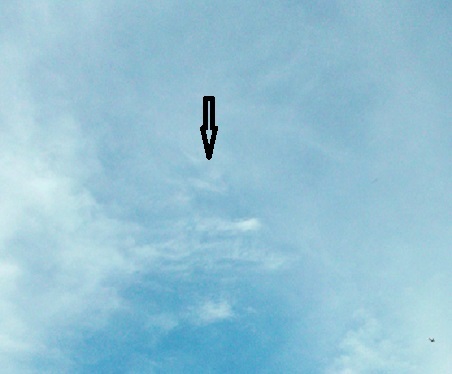 Ahura’Tua beside semi-circle/crossbar cloud (or bow and arrow, also birdlike form). 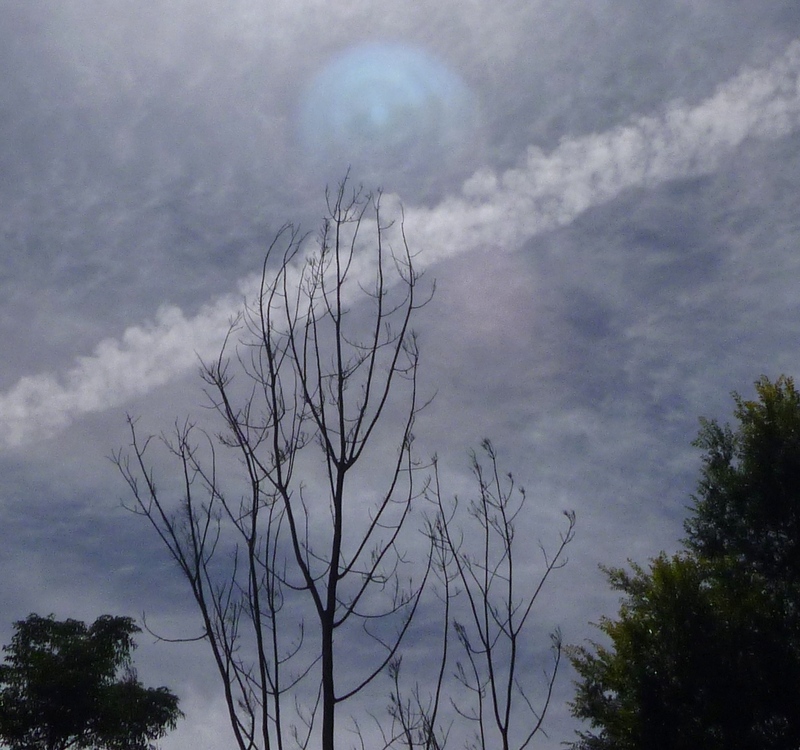 The first half of 2015, I’ve been seeing a lot of cloud-ships, perfect disc-shaped or triangular/diamond-shaped cloud holes where ships are phasing in and out across dimensions, often with a spiral of clouds ‘vacuumed’ into the space where the ship was. 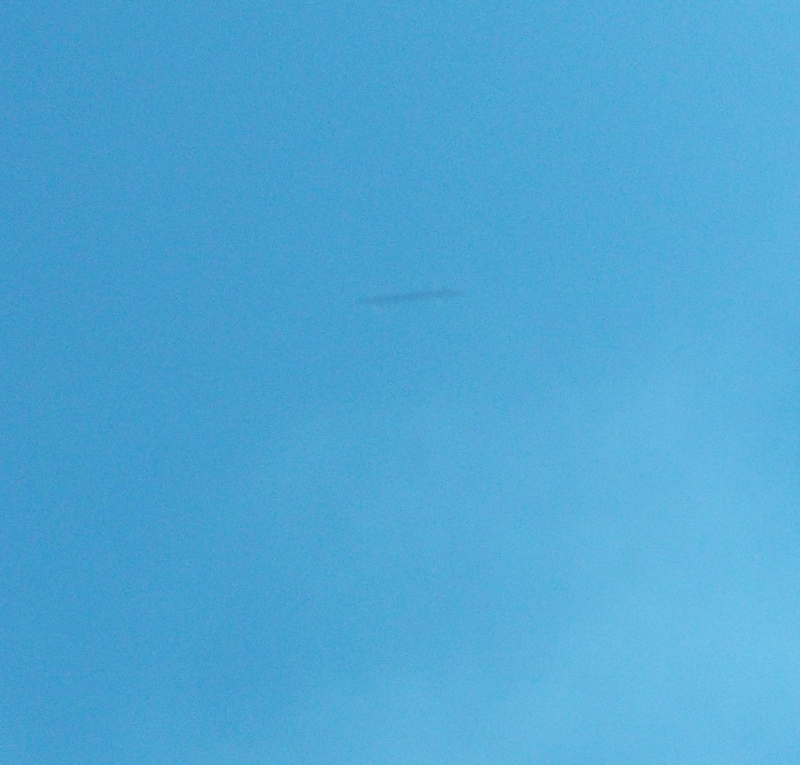 The Sirian-Cetian ship below appeared above a plane, which you can see flying off to the lower right, giving a good idea of the scale of this ship. Photo taken June 16, 2015. Close-up, with Cetian whale-like beings visible ‘swimming’ inside the ship. 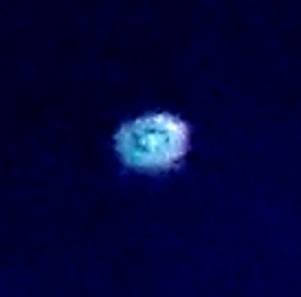 Many Orbs appeared around this ship, a projection its captain and crew. 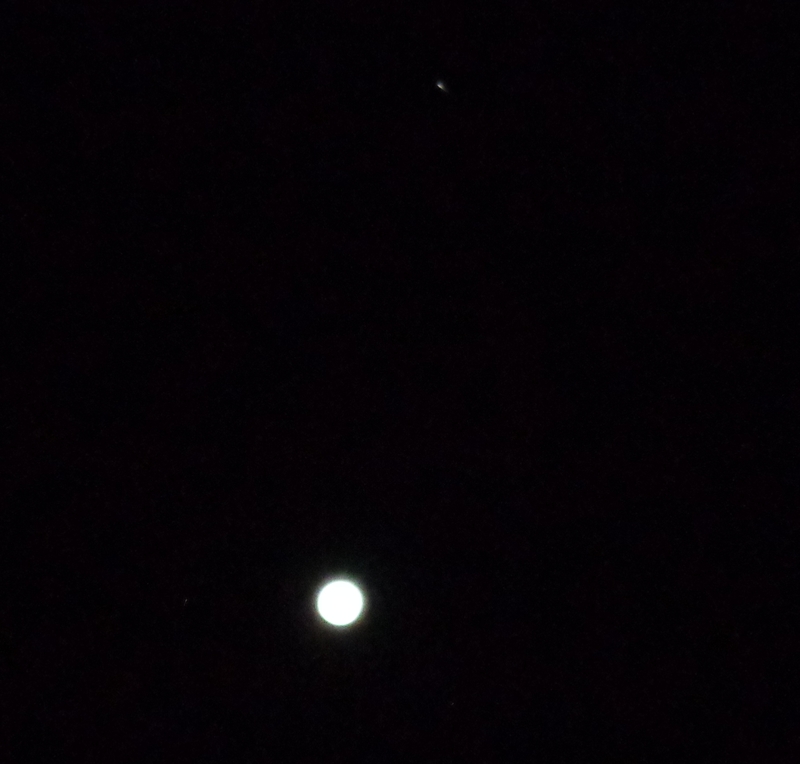 Here is the clearest of them, with many beings visible within it. You can read about them here. 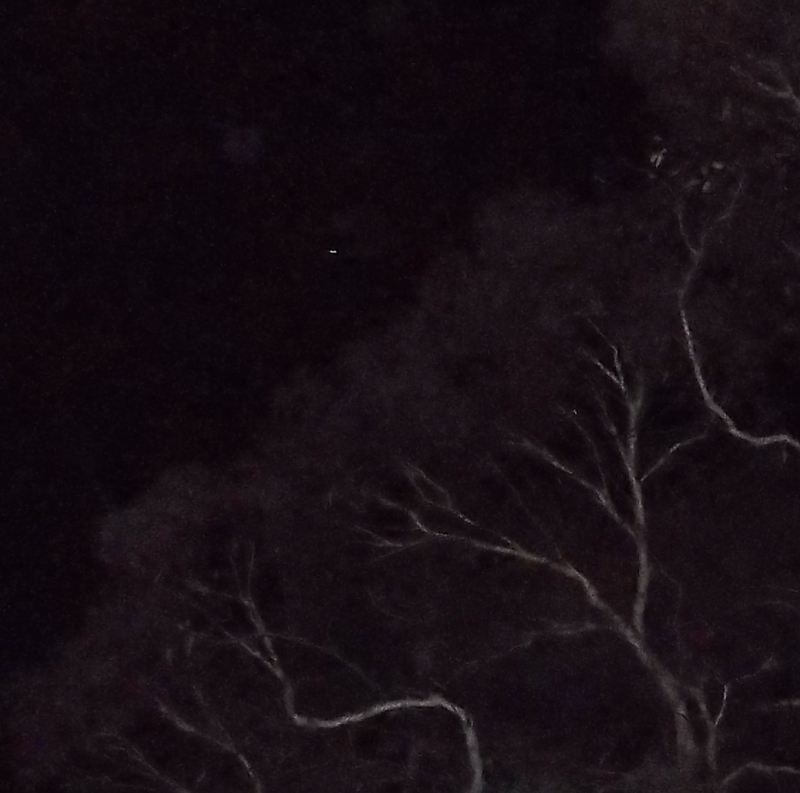 The small ship below appeared, firstly as a pair of lights between trees, on August 25, 2015, before moving west behind the trees to appear more brightly above them, with more of its structure visible (see this post). 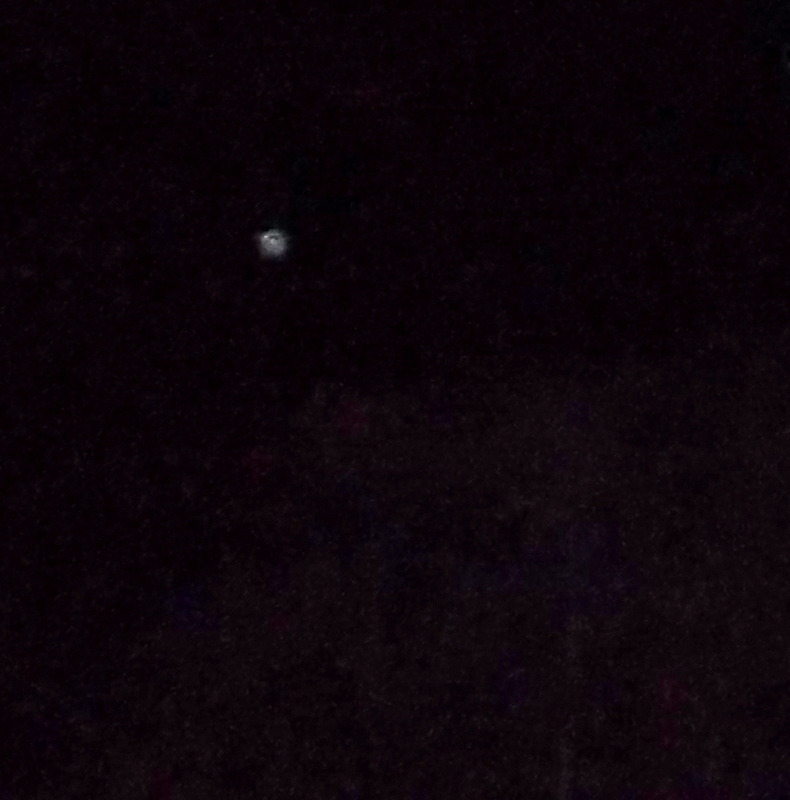 Small ship appears as two lights in a gap between trees, lower right of frame, August 28, 2015. 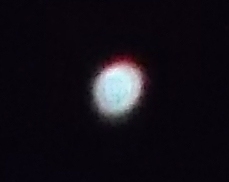 Close-up, with accompanying orb just visible above. 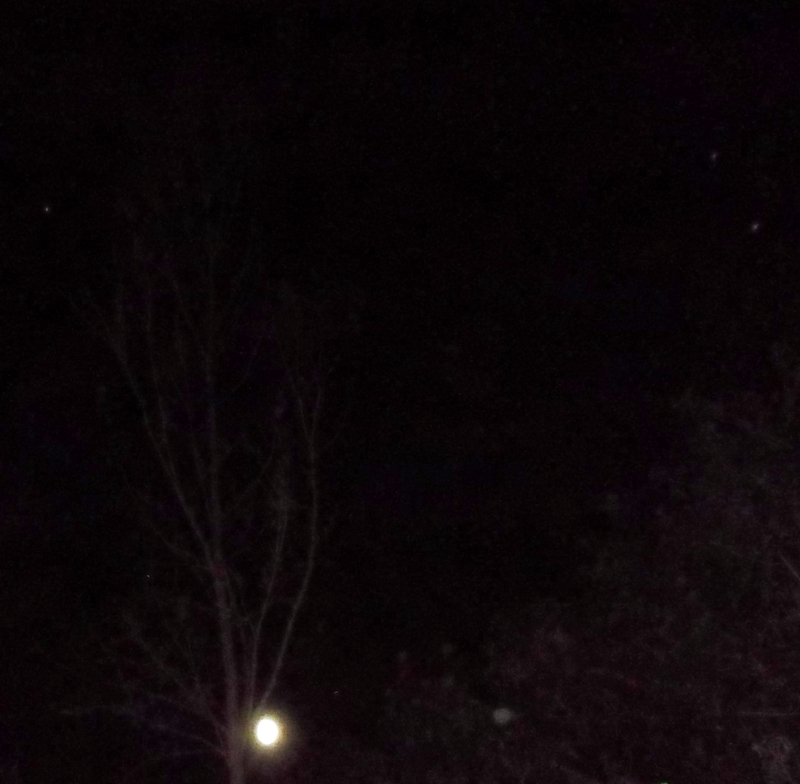 The ship decloaks at left above the treetops, showing a triangular structure with three interconnected hubs, Orion origin (within guarding Arcturian energies). A ‘pod’ visits from the Orion mothership; its delegate is seated at a control panel (white band at front) above a red base. 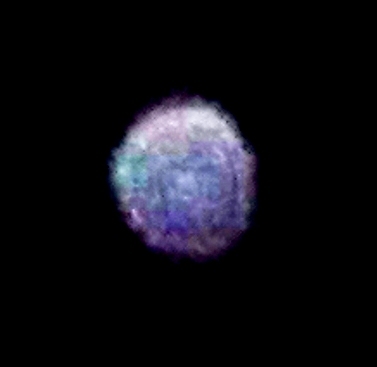 He’s wearing a blue uniform, and there’s a translucent violet coloured dome-shaped canopy over his craft. 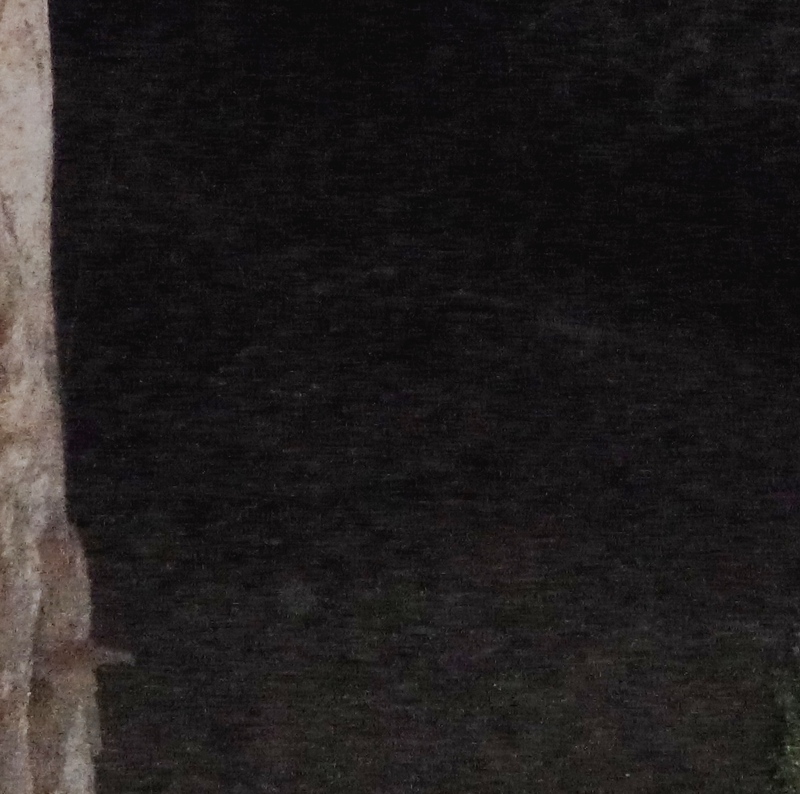 Photo taken August 30, 2015. 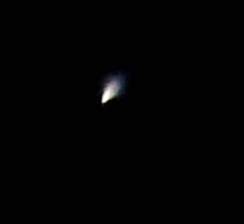 Another small ‘pod’ ship comes down from the Orion mothership, September 8th, 2015. Close-up of Orion ‘pod’, clearly showing its form within its light-shield, Sept. 8th, 2015. The same Orion ‘pod’ ship on September 11, 2015. 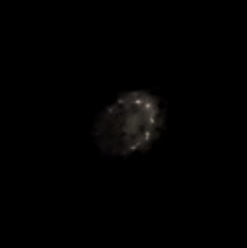 Close-up, with the ship’s structure less distinct, not in full ‘light pulse’, Sept 11, 2015. A similar craft from the same mothership appeared on September 15th, in different colours. This is the first Orion pod again, with people visible standing and seated, and its distinctive visual ‘message’ of blue, white and red light, September 23, 2015. 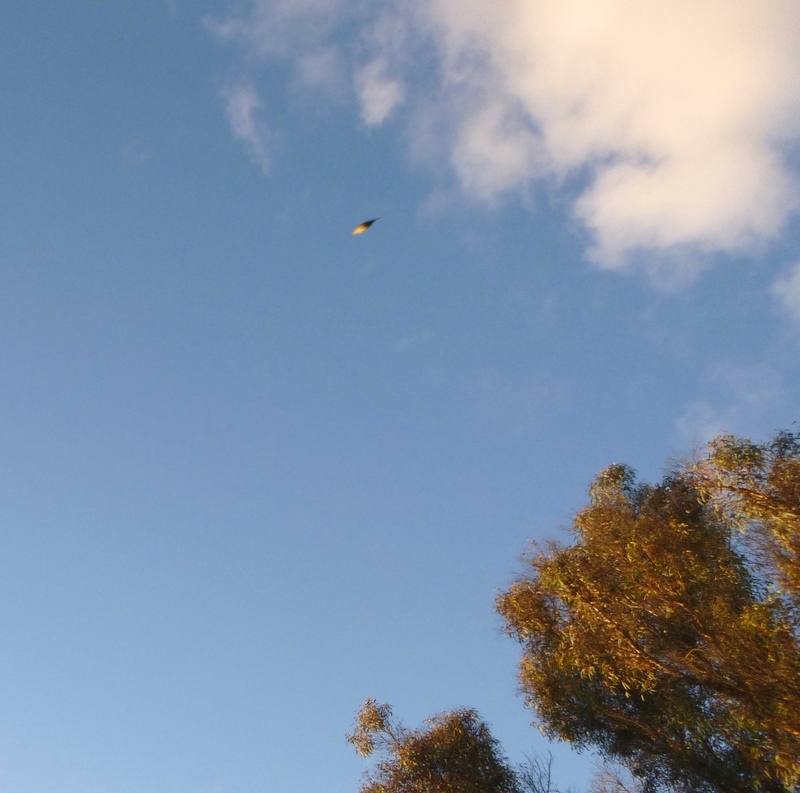 The pod ‘transverts’, as they termed it, angling its light at specific geometric frequencies, crossing dimensions, September 23, 2015. 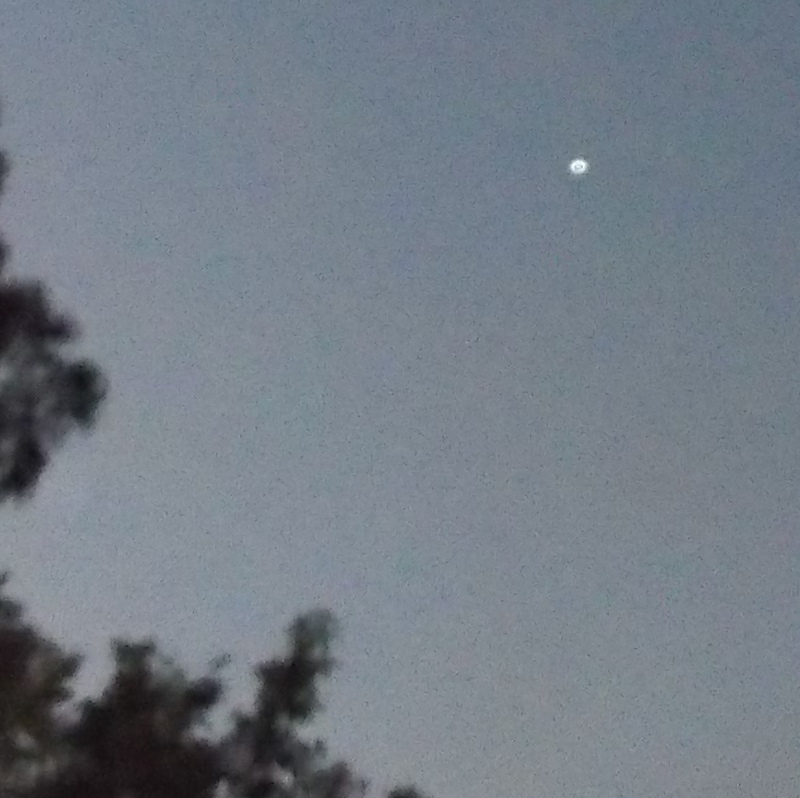 This beautiful silver ship decloaked for a couple of seconds above a walking trail near my home on October 21, 2015, and is described by Ashura as a ship flying in the company of the Shem Arua. You can read more about it in this post. Here is what the ship would like like if you were looking straight down on it, with two pods on the disc ‘roof’. 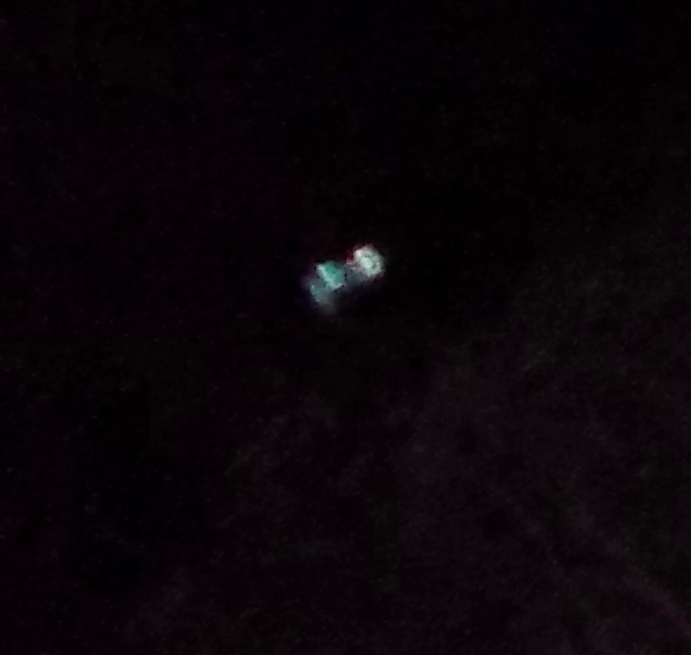 This beautiful long triangular Sirian-type ship with an Antarian crew, named the Terebinth (Ta’Ra’Bi’Nu(t)Ha) flew around the Moon, on the night before full moon, October 27, 2015. 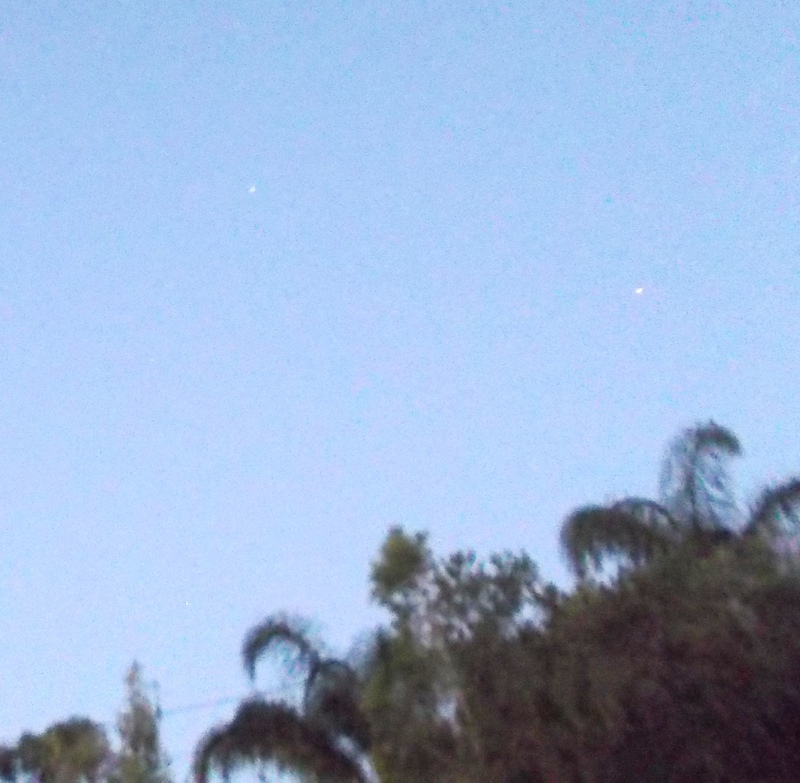 This cluster of ships also appeared above the Moon the same night, October 27, 2015. Including this beautiful green bow-shaped ship, with a ring of lights around its crescent. 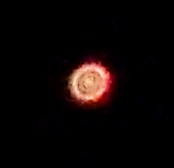 The Orion mothership (which the Orion ‘pods’ flew down from) appeared above the roof of my house as a small light high up on Nov. 3, 2015. 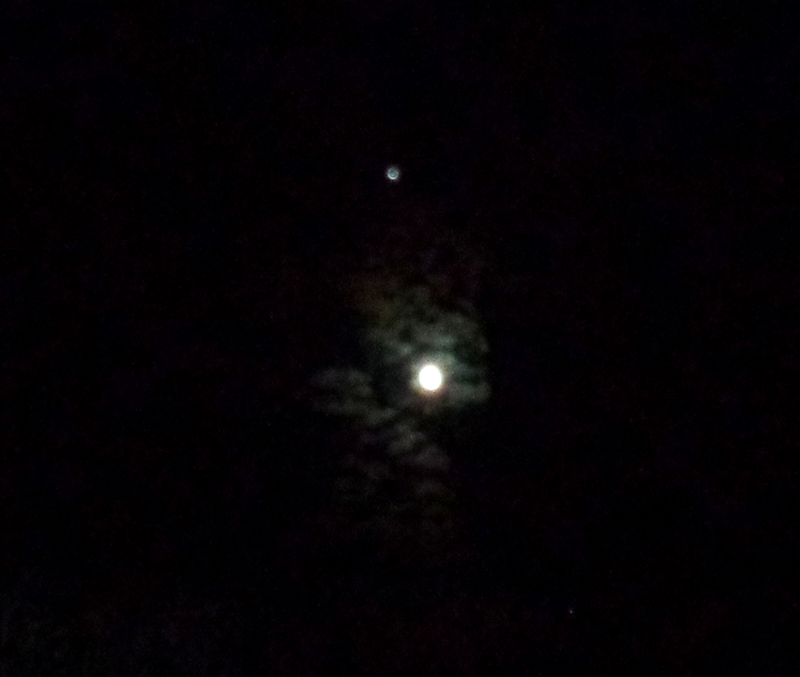 Here it is again the same night, with its wide white ‘front’ visible. 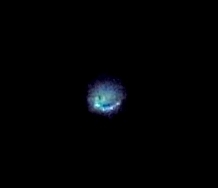 Alpha Centaurian small blue-green ship with horseshoe rim of lights visible, November 22, 2015. 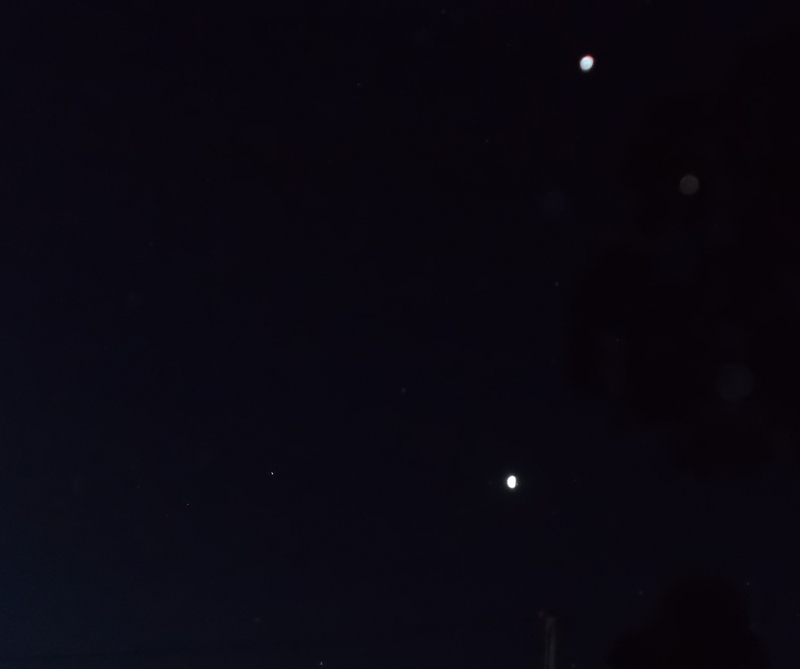 These two small purple lightships from Tau Ceti in the Cetus (Whale) constellation appeared on November 26, 2015. This beautiful bell-shaped Pleaidian ‘saucer’ ship showed itself on December 19th, 2015, upper right of the half moon, with communications from a lady on board named Ariane, of Alta Mira (near Alcyone, alpha star of the Pleiades). A similar ship visited again three nights later, on December 22, 2015. 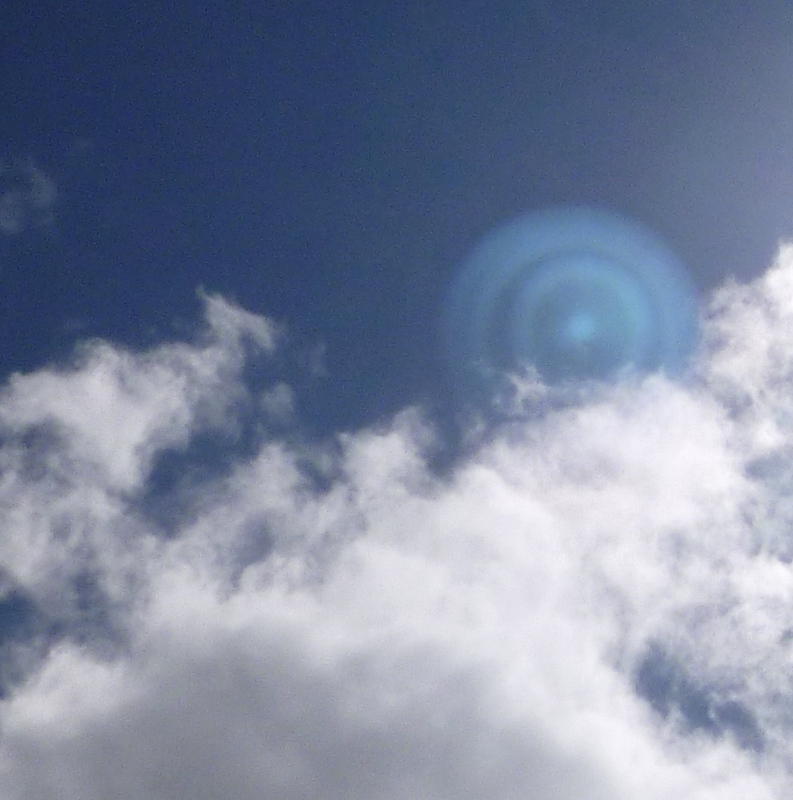 I was asking about the upsurge in Pleiadian presence I was feeling at the time. 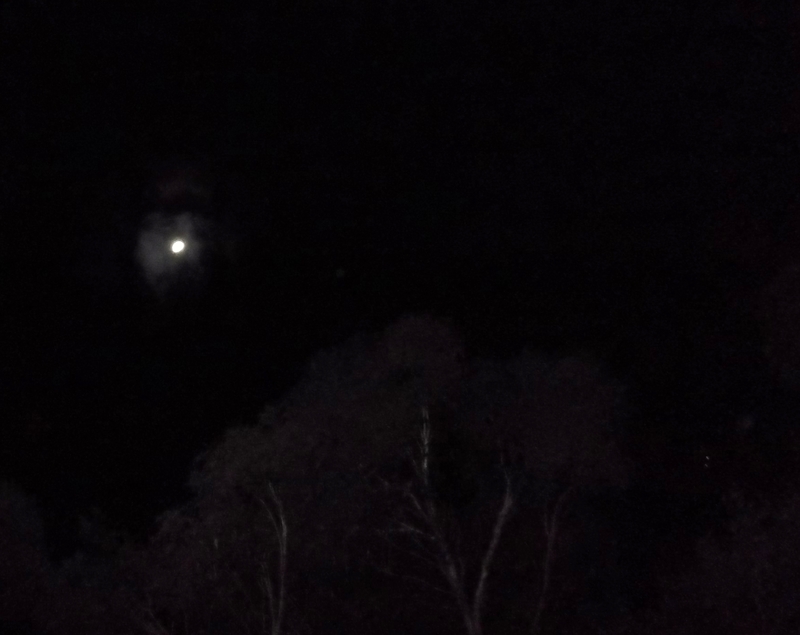 A red light ship also appeared in the distance (see upper right of frame, above the treetops, while a beautiful purple (Whale Being) orb appeared partially behind clouds near the Moon, December 22, 2015. 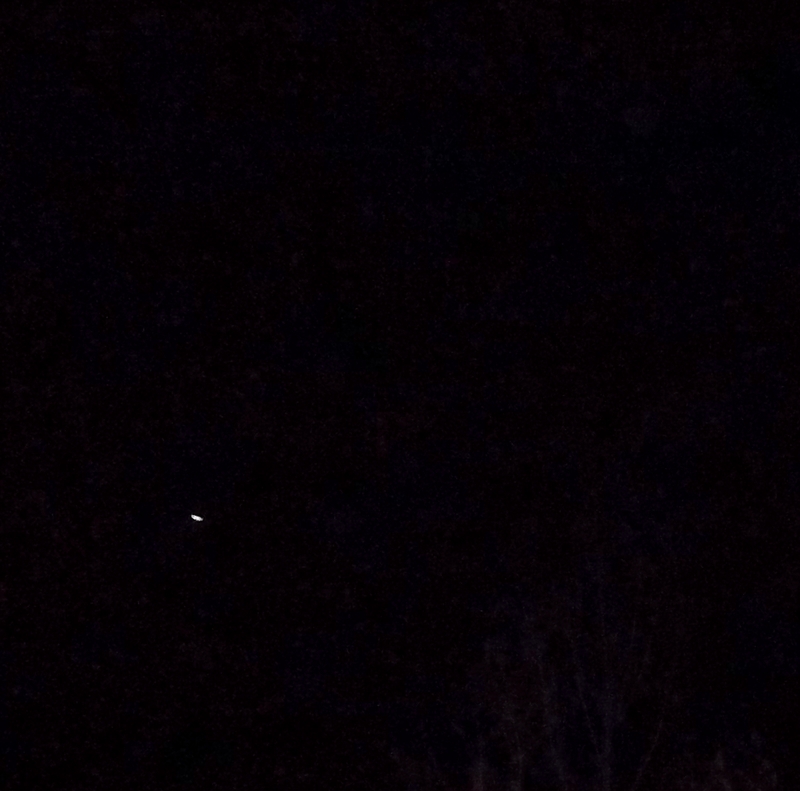 I’ve seen these flashing red lightships on numerous occasions since the Blood Moon of September 28 (the moon appeared blue to my vision that night, with many red lights flickering around it), and now know them to hail from the star Antares. 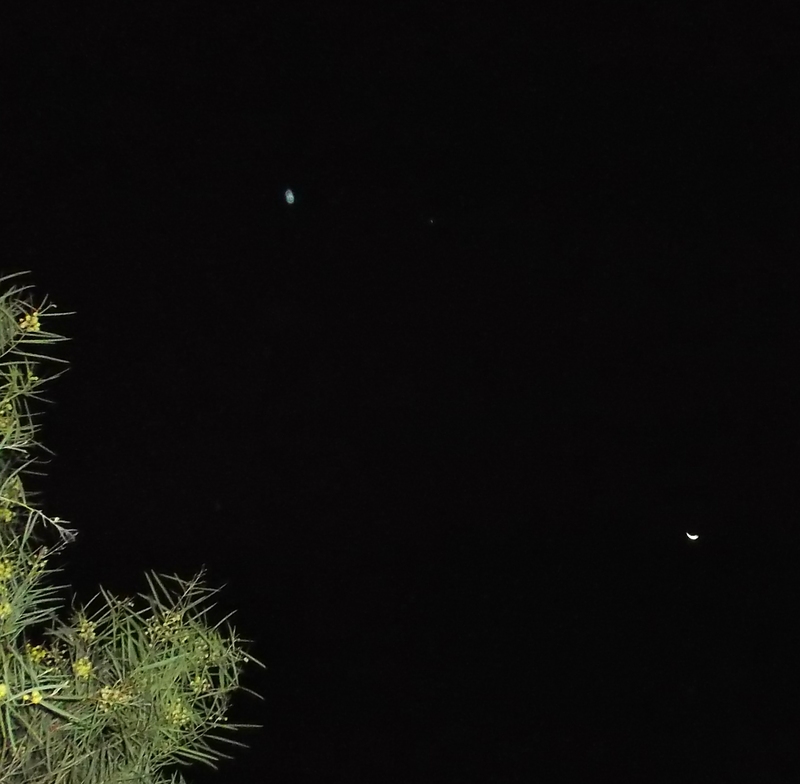 Four ships appeared around the star Sirius (the tiny point of white light inbetween them) on Christmas Night, December 25, 2015. Here’s the brightest and nearest of the four (lower left), a Pleiadian ship, which had shimmering rainbow colours running through its disc. 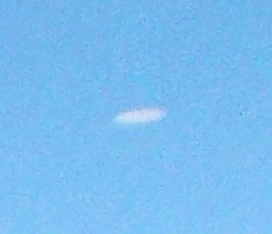 It was facing straight toward me, and is a disc with a central domed canopy, like this. 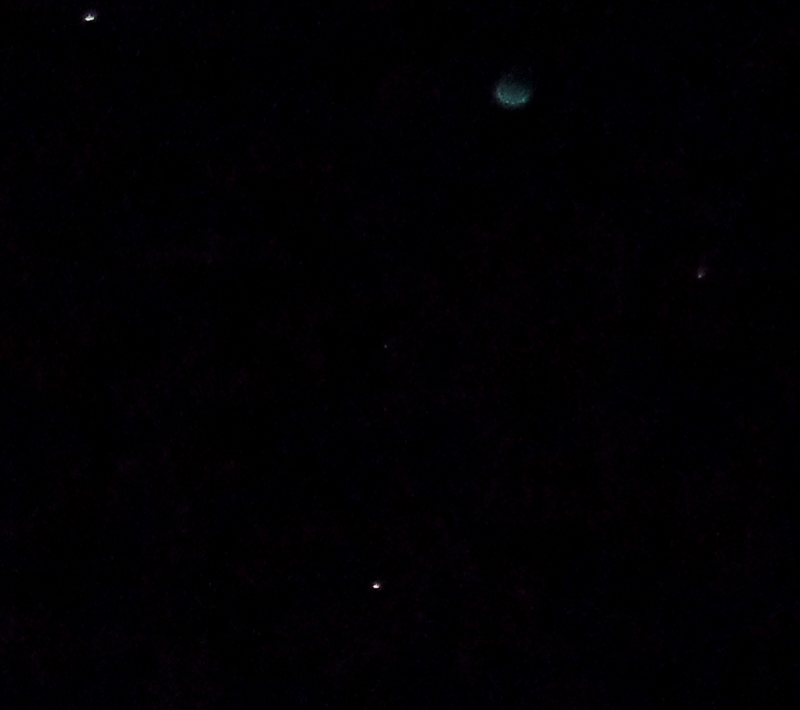 Here’s a close-up of the second brightest/closest ship, in the upper part of the frame, with a distinctive emerald-green canopy. 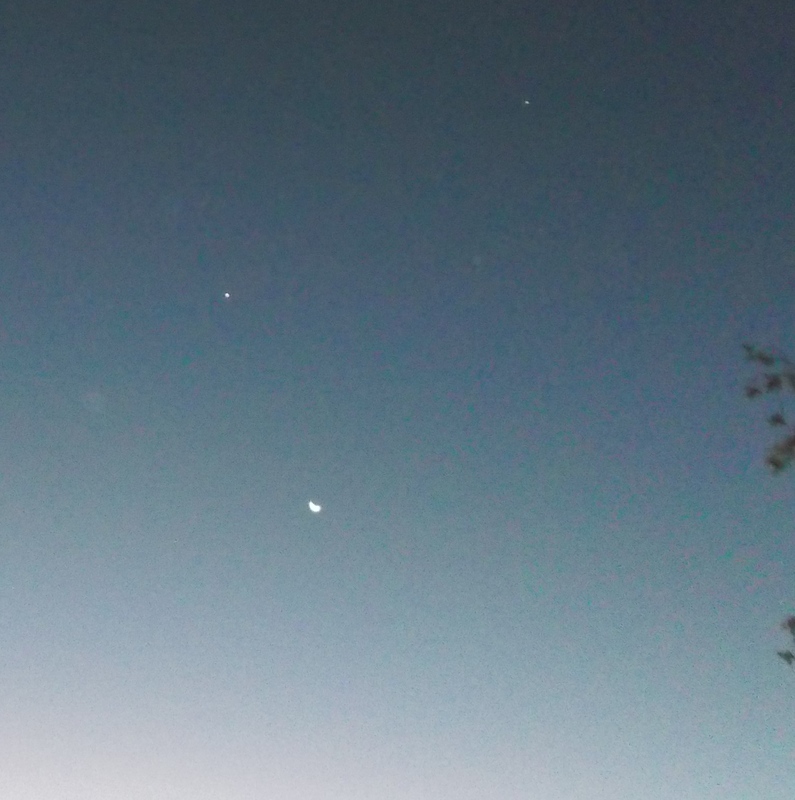 Since late 2015, I’ve connected with people from the star Antares (alpha star of the Scorpio constellation). You can read about them in this post and this one. Continue on to the Lightships 2016 page to see these Antarian and more current ship photos of this year. On the remainder of this page are a few favourite photos from earlier in my contact with star family, from 2012-2013. These are Ashtar Command/Intergalactic Confederation ships, representing many star nations and constellations, including Sirius, Arcturus, Orion, the Pleiades, Andromeda, Lyra, Ursa Major, Procyon, Altair, Antares, Cetus (Tau Ceti), Centaurus (Alpha Centauri), Cygnus, Aldebaran and Venus. While ships may be predominantly from one planet/star system, there are often beings (human and otherwise) of many different origins on board a single ship…..as a harmonious unified collective, currently stationed around the Earth and the Solar System in great numbers to assist it – and humanity’s – Shift (‘ascension’) into a higher frequency state of unity consciousness. 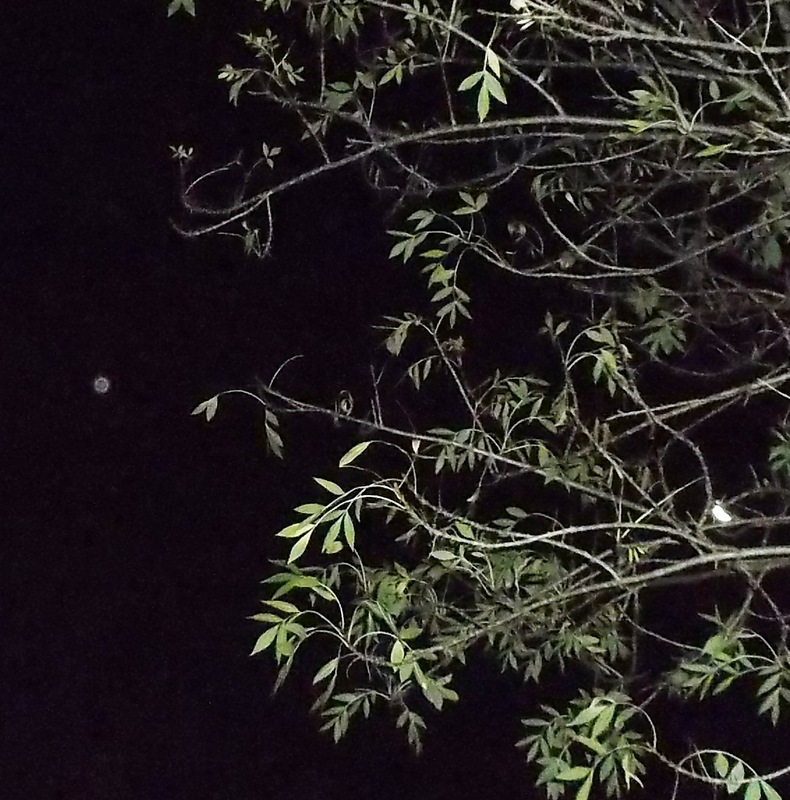 The first photo is from late 2012, an Andromedan ship whose presence I sensed between Jupiter and the Moon during a conjunction. 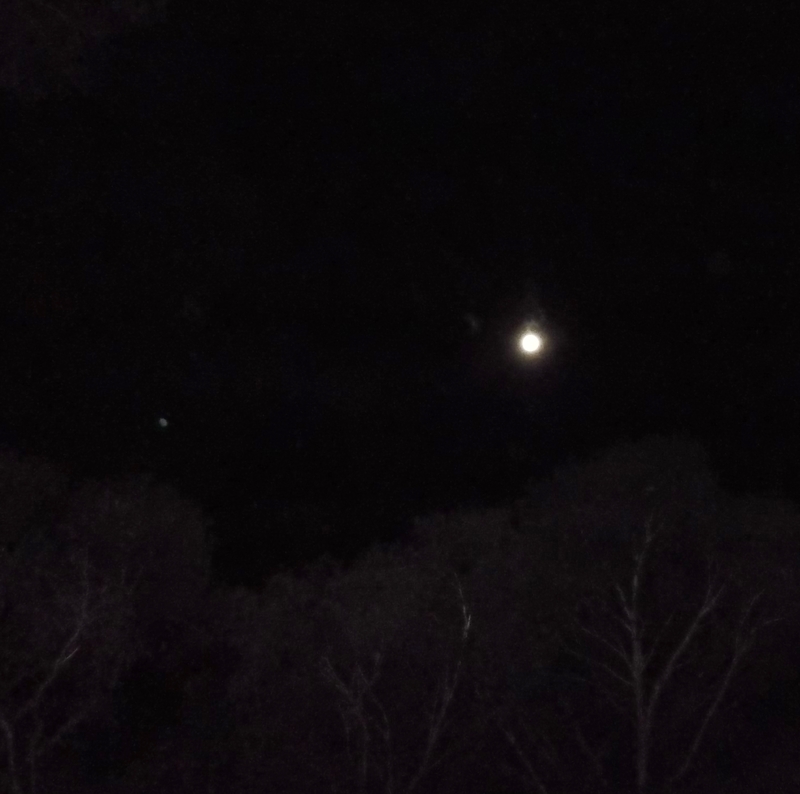 By the time I had gone back into the house for my camera and returned outside, this ship was visible overhead (the Moon is below, ship above). The ship photo archive continues at Lightships 2016. Thank you Thank you for these! I live in the mountains of Northern California and have seen ships. It’s not a particularly well received thing to tell people… 😀 Much Love from here. ps – I come to your site through the interview with Ray Dawn in Mt.Shasta. I’ve had the pleasure of sessions with her and she is indeed, amazing. 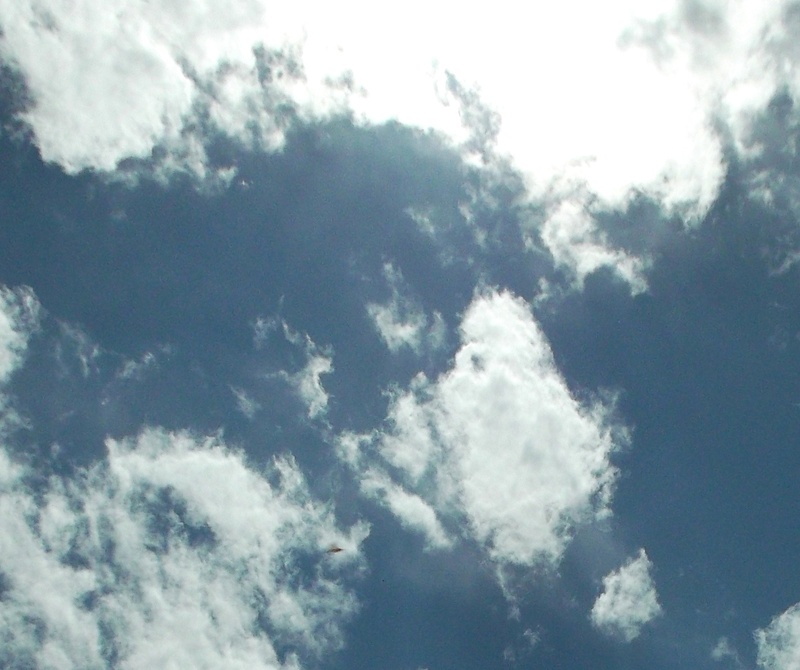 I love reading this website and the Whispy clouds website. 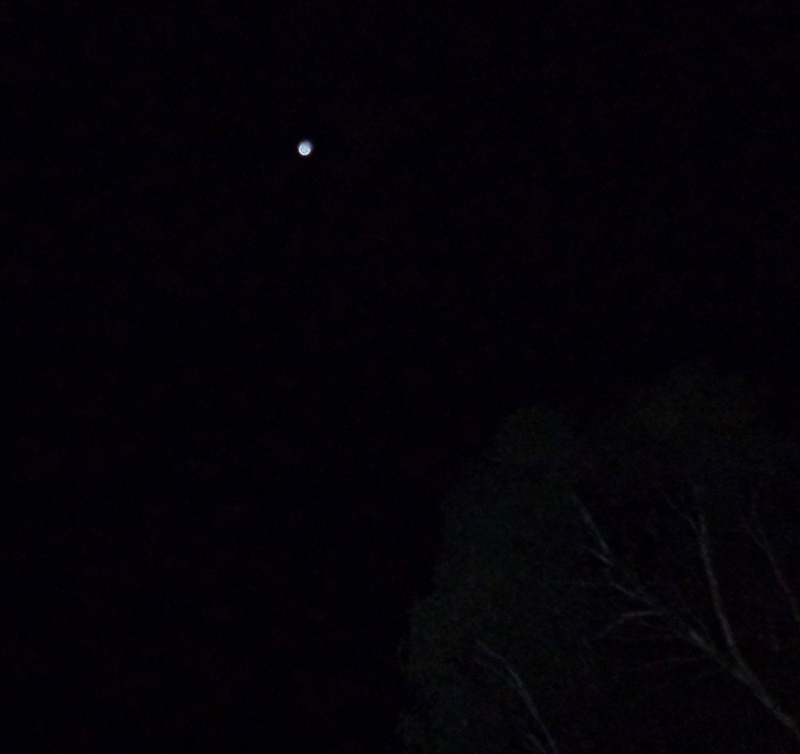 I took a photo of a Ufo/ship last year here in Perth WA and i’d love to send it to you to see if you know where it came from. 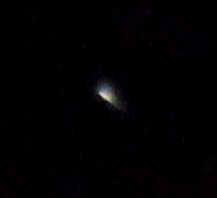 Love your description of the UFOs and stars…I also see stars flash in colours. It IS an awesome journey!! Lovely to connect with you on it. I’ve just added some new photos of the Shem Arua, if you want to scroll this page again, including some daytime ones of it in 3D from yesterday. Ah I am quite glad to see that someone blogged so thoroughly about the Lightships. My deepest fear is that they were CIA or secret space program dummies, but to what end? They move like ET craft (in my opinion) rather, and also seem conscious of my observing them. 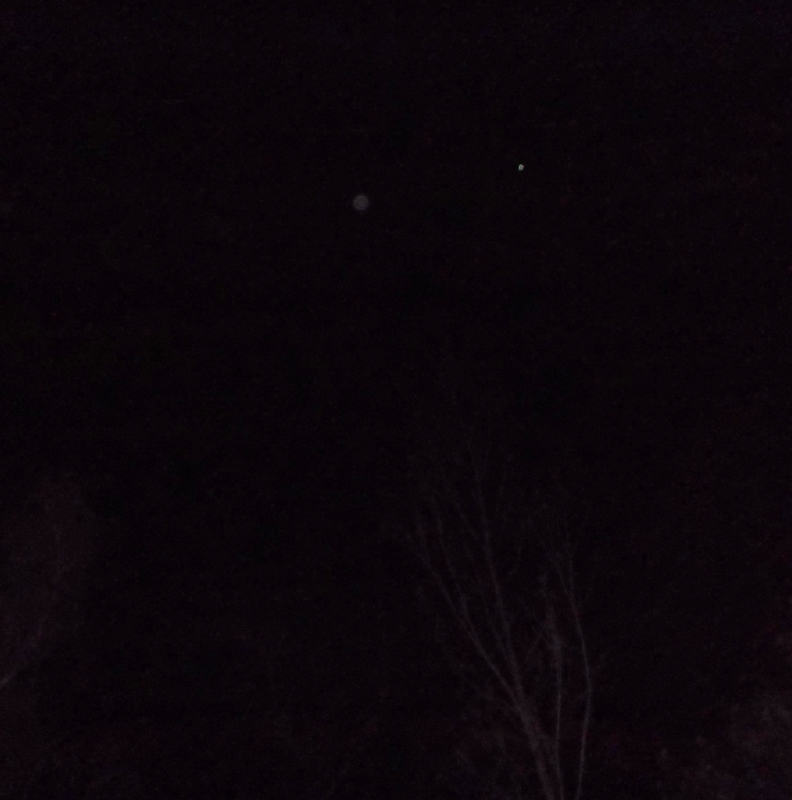 Where I live in Northern Colorado, at least three Lightships become visible nightly as long as the clouds haven’t obscured the night sky. We had rain for the past three weeks and my concern is that a space war was being hidden from our sight, like mom and dad fighting and telling us to go back to bed. 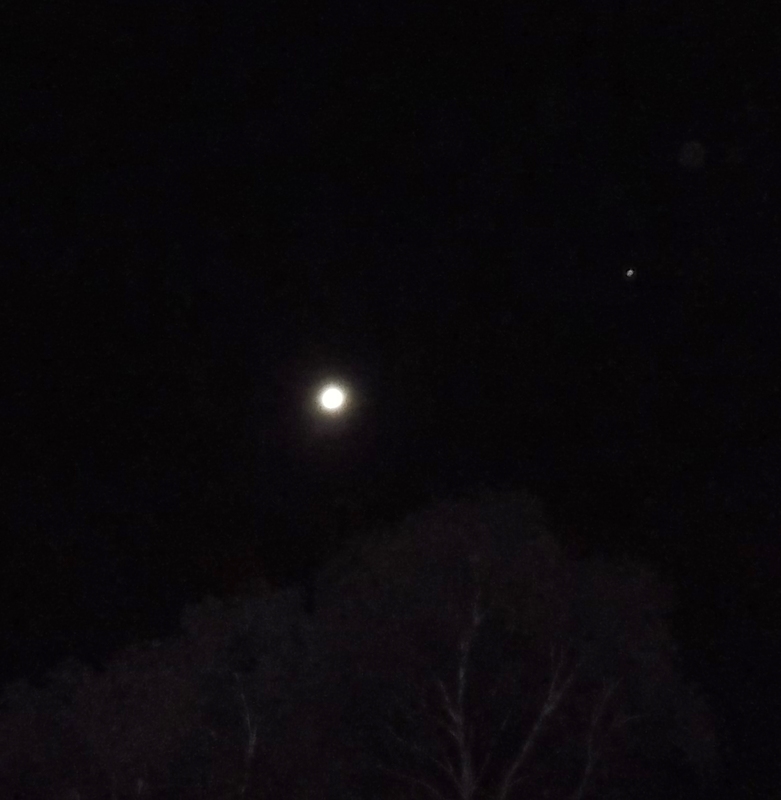 But finally when the sunshine returned and the first clear night sparkled brilliantly like a diamond, our Lightships maintained their position in the sky like aeternal beacons of hope. Cosmic reality is THE reality. Hi Broox, thanks for your response, and sharing about the ships you see on a regular basis. Breathe into your heart, centre yourself there, and feel into what is with you. Without expectations, stories or attachments, just allow yourself to feel. Craft not of benevolent intent, reverse-engineered, military etc. tend to have a ‘flat’ or ‘cold’ feeling. 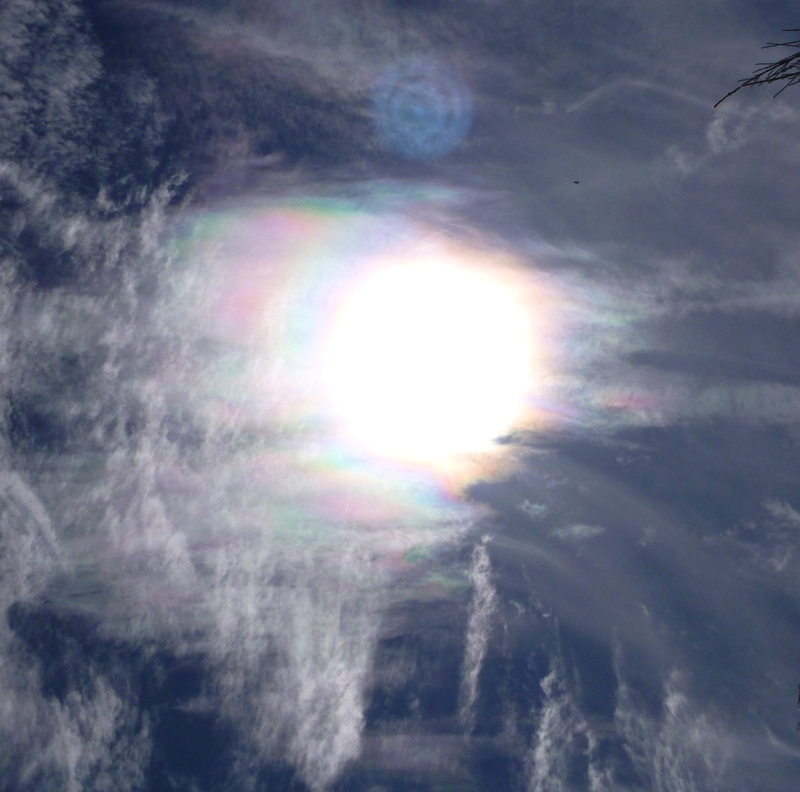 Higher density beings are well aware of our thoughts and feelings, connect easily, and show their love in innumerable ways, that may include other synchronicities with ship ‘sightings’, and responses to your thoughts/feelings, if you are of love. 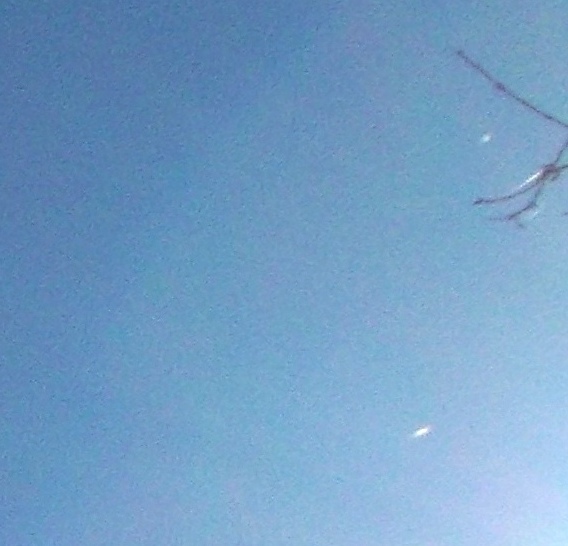 most ufo pics are hard to believe in, but yours look more trustworthy…. 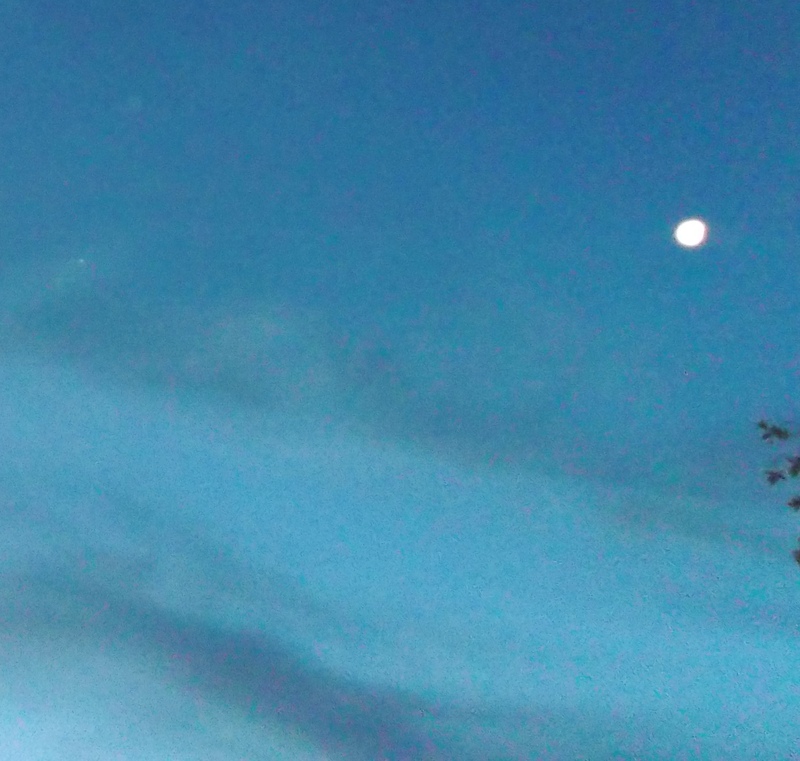 small pieces in sky i.e. Hi Michael, thanks for stopping by and I’m glad you enjoy the photos and they resonate for you as trustworthy. I have met with star family members in Inner Heart meditations/visions and in dreams, often before being aware of or seeing ships close by/overhead. For me, it’s the Inner Heart focus that has helped me (and still helps me) to ‘see’, hear, feel & be aware of who is with me, and where they are. You’re right, they are well aware of our thoughts and feelings, and at a certain stage that can become a two-way flow. 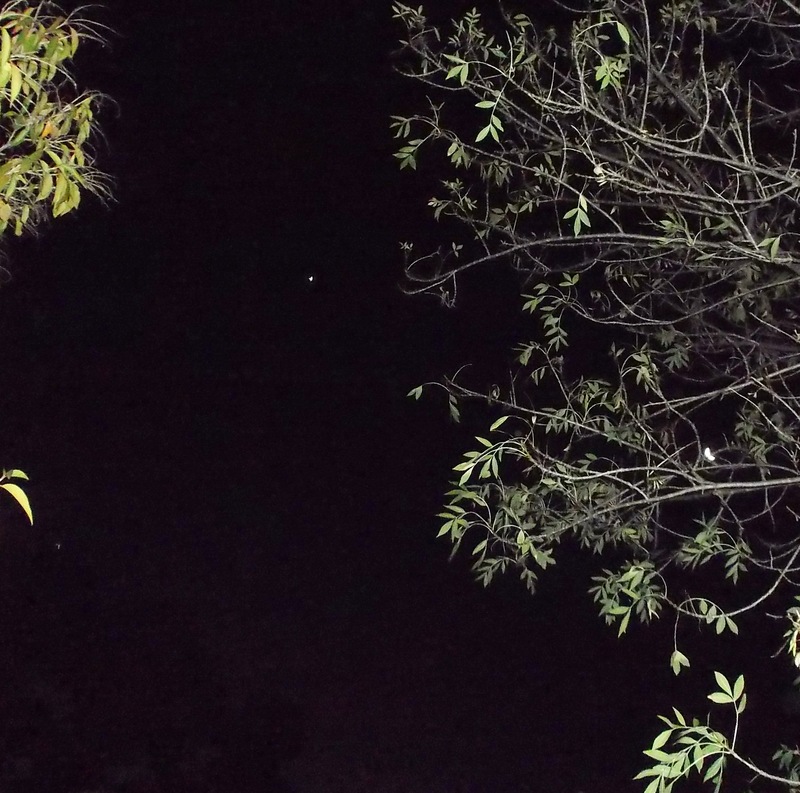 🙂 Where I live there are many trees with only patches of sky, and I find star family always know exactly where I am, in terms of how/where they position their ships, or I’ll feel an inner sense or call to go stand in a certain spot. 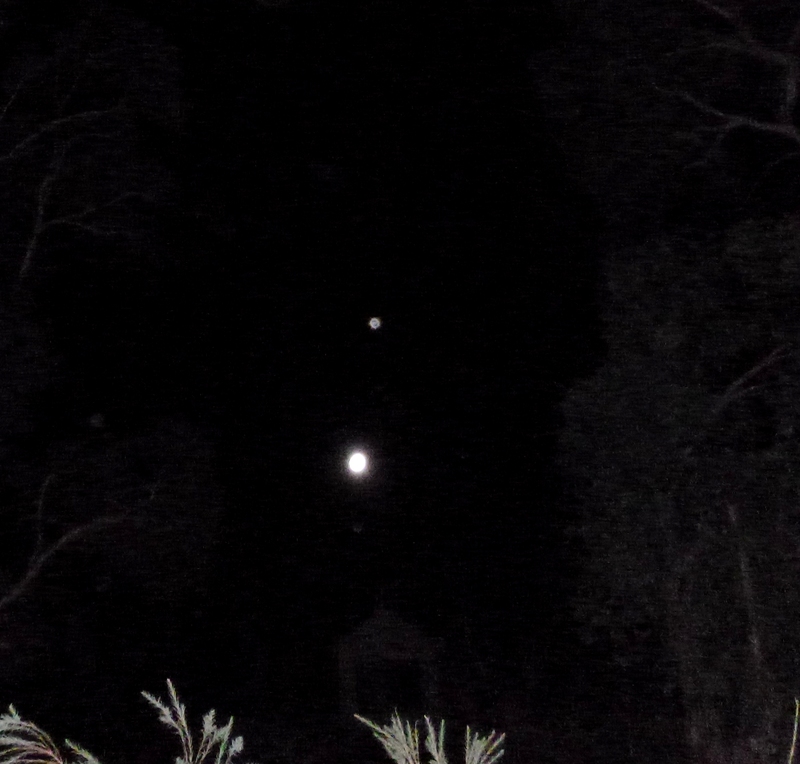 For instance, last night, I felt strongly to stand in front of the house, looking towards the peak of the roof (it’s highest point); I could only glimpse ships as brief flashes, they were very high up…but the camera caught an orb and ship together straight above the roof’s peak, in another shot two orbs positioned exactly either side of the peak, same distance apart, and a tiny pyramid-shaped ship showed up…which was in response to the particular star nation I’ve been focused on this week (the ship is actually not so small, but far above).